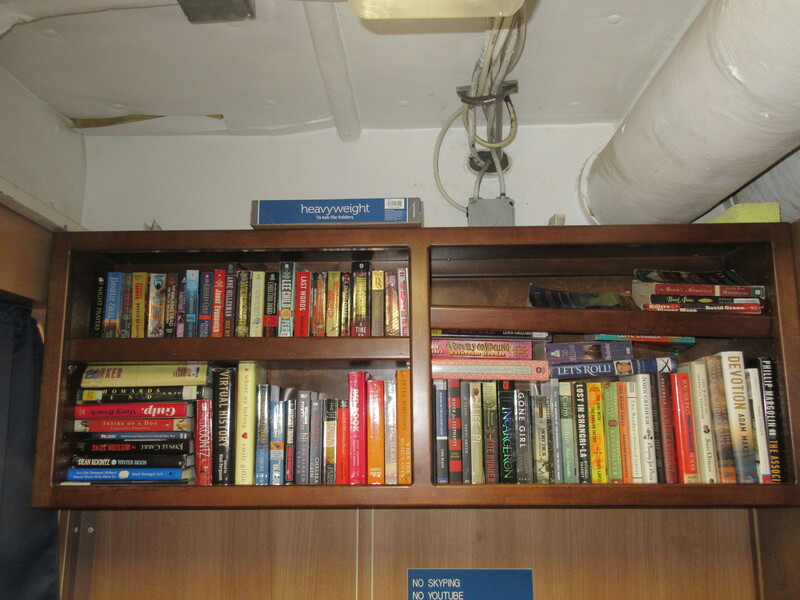 Life at sea provides fathoms of real-life examples of the nonfiction text structures I teach my students to identify: description, order and sequence, compare and contrast, fact vs. opinion, problem-solution, cause and effect, and several others. While on the Oregon II, I was very fortunate to observe a dive operation that took place. Here’s how an account of the dive operation might read for my elementary school students. 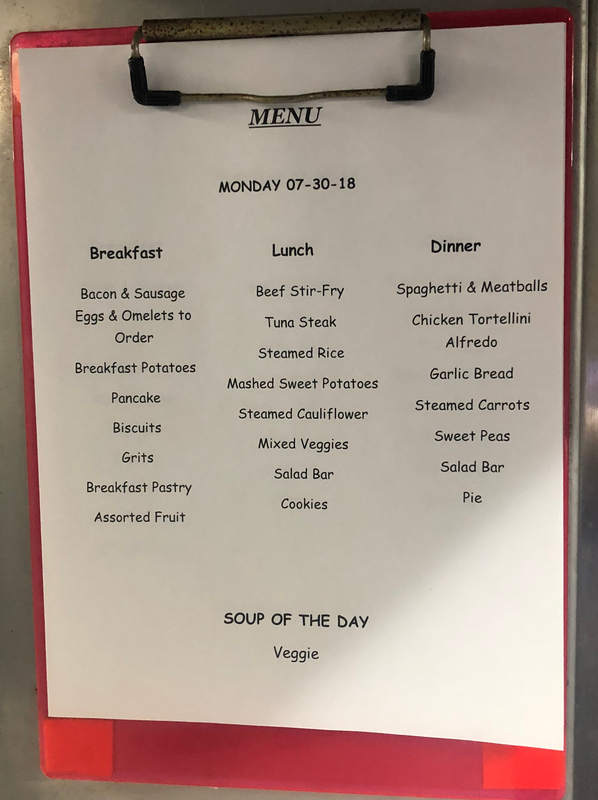 Embedded in the text, I’ve included opportunities for developing readers to use context clues, to notice words that signal order/sequence (first, next, then…), to notice words that signal compare and contrast (similar, unlike), etc. 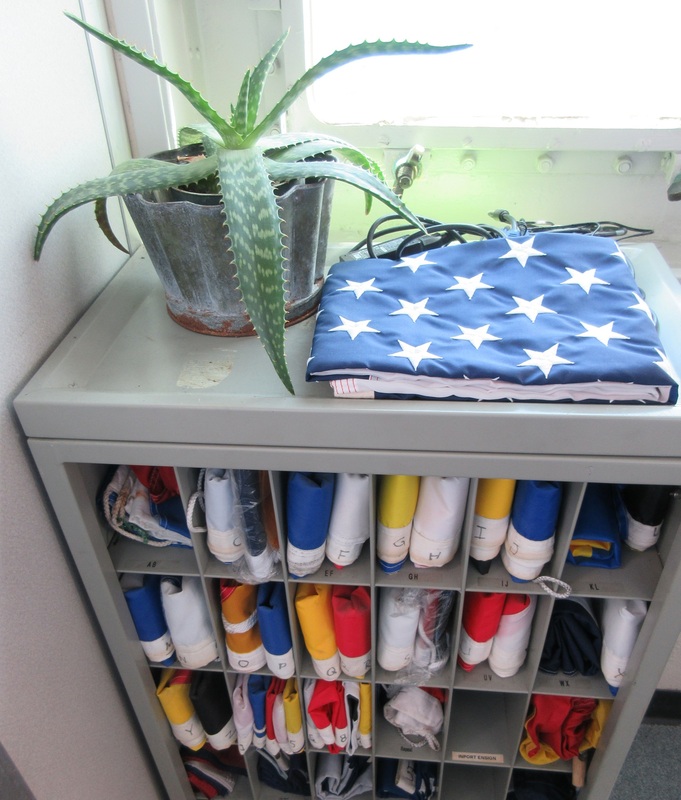 A ‘diver down’ scuba flag on the Oregon II. Problem: Sometimes, the hull (or watertight body) of a vessel can become encrusted with marine life such as algae or barnacles. 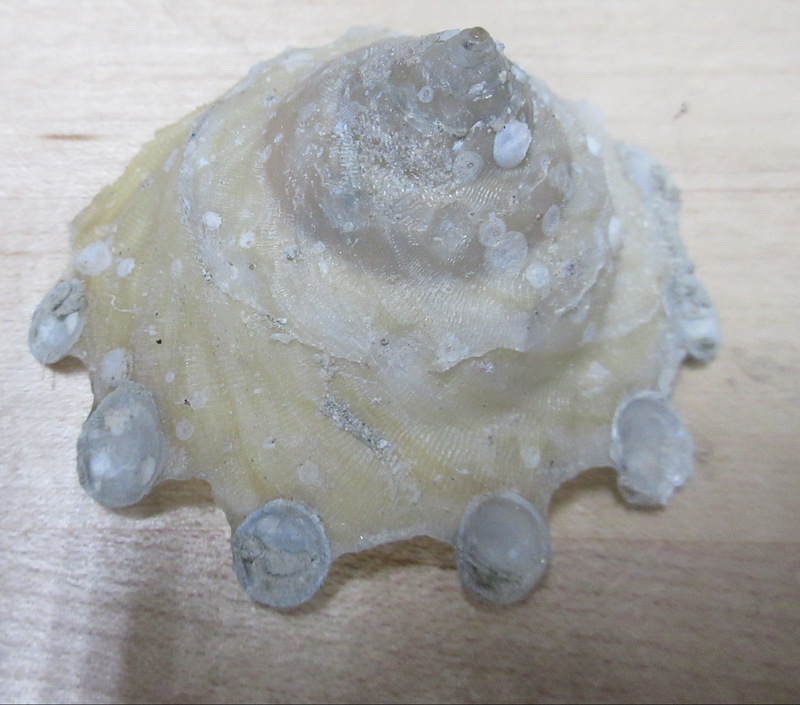 This is called biofouling. 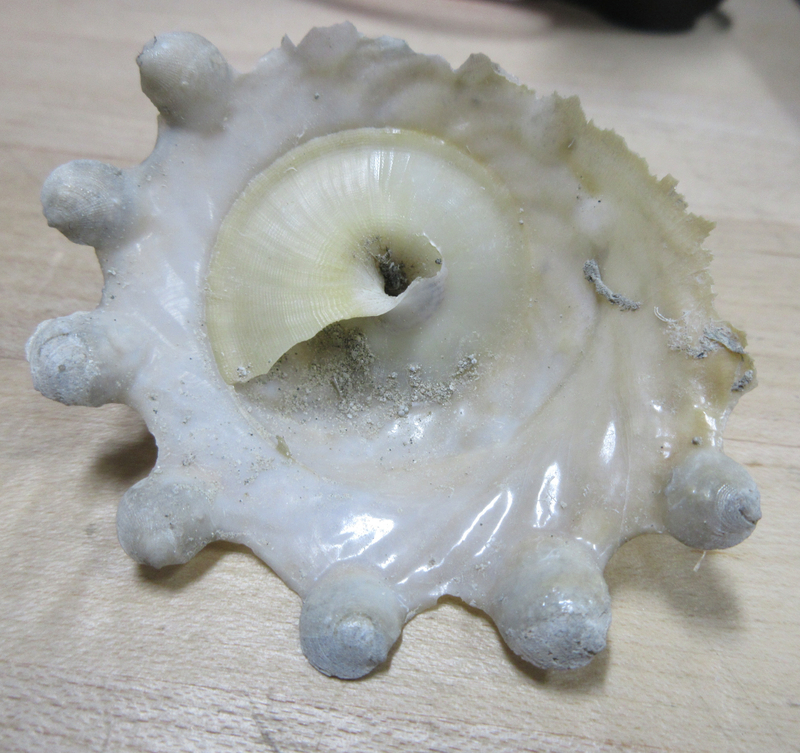 To prevent biofouling, underwater surfaces are inspected and cleaned regularly. To further prevent creatures from making the body of the Oregon II their home, the hull is painted with a special anti-fouling paint. 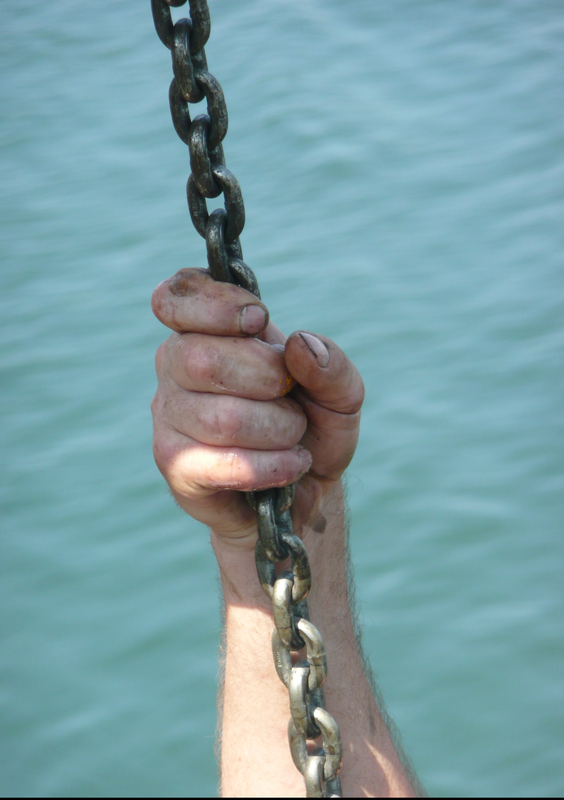 Occasionally, man-made materials, like rope and fishing gear, can get tangled in the equipment that sits below the surface of the water, such as the rudder or propeller. 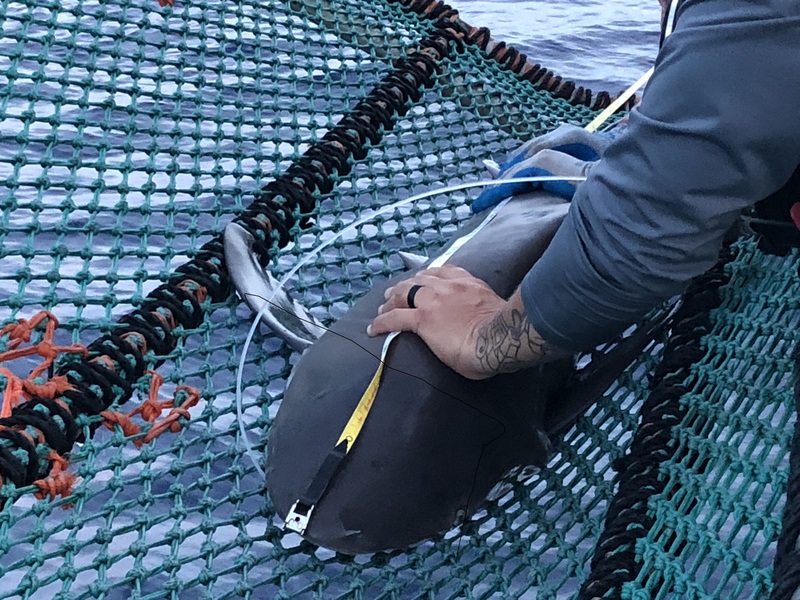 Underwater GoPro camera footage suggested that a piece of thick plastic fishing line (called monofilament) was near the Oregon II’s bow thruster. The bow thruster, located in the front of the ship, is a propulsion device that helps to steer the ship to the port (left) or starboard (right) side. 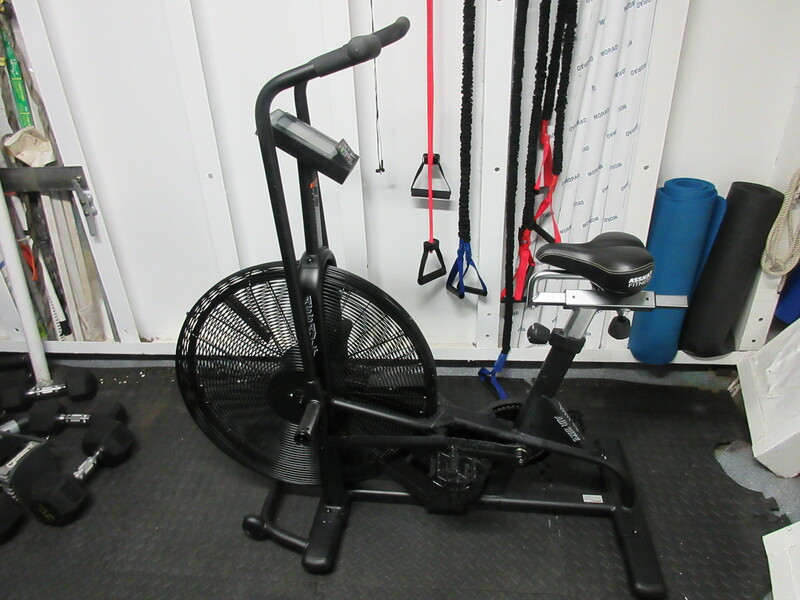 This makes navigating and docking the 170-foot ship easier. When the powerful bow thruster is engaged, the entire ship rumbles, sounding like a thunderous jet soaring through the sky. 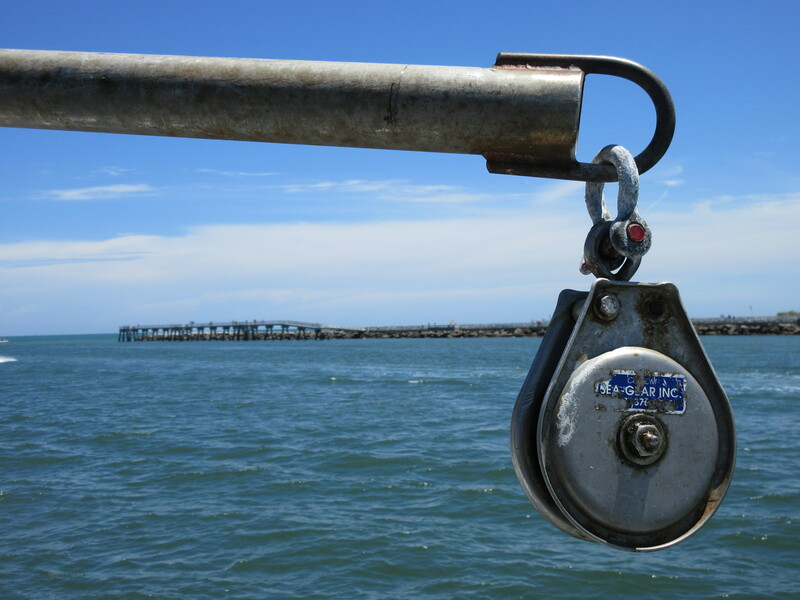 Something like entangled fishing line is problematic for navigation and safety, so the line must be removed if found. Because the bow thruster is located beneath the water’s surface, this task cannot be completed while on the ship. So how can the crew remove any tangled line and inspect the hull for damage? 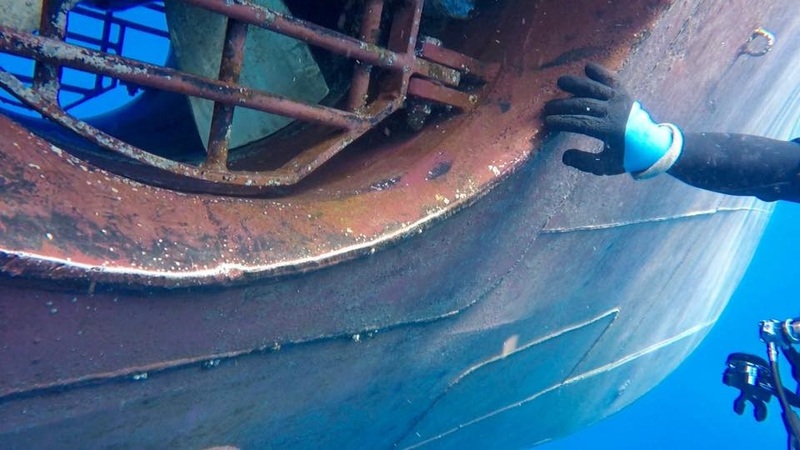 Solution: Divers must swim under the ship to inspect the hull. If fishing line is suspected, divers can investigate further. This opportunity to “inspect and correct” allows them to take a closer look at the hull. 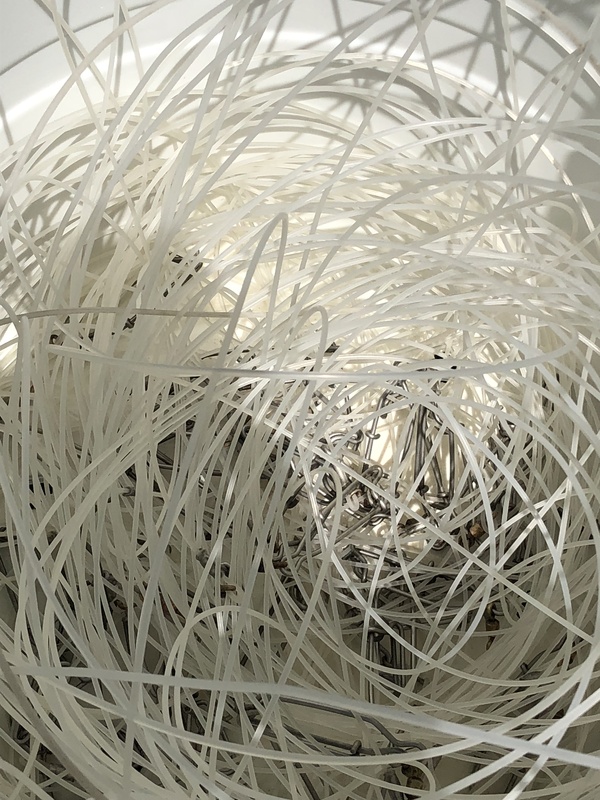 If fishing line or other damage is found, divers cut away the line and report the damage. Routine hull inspections are part of regular ship maintenance. 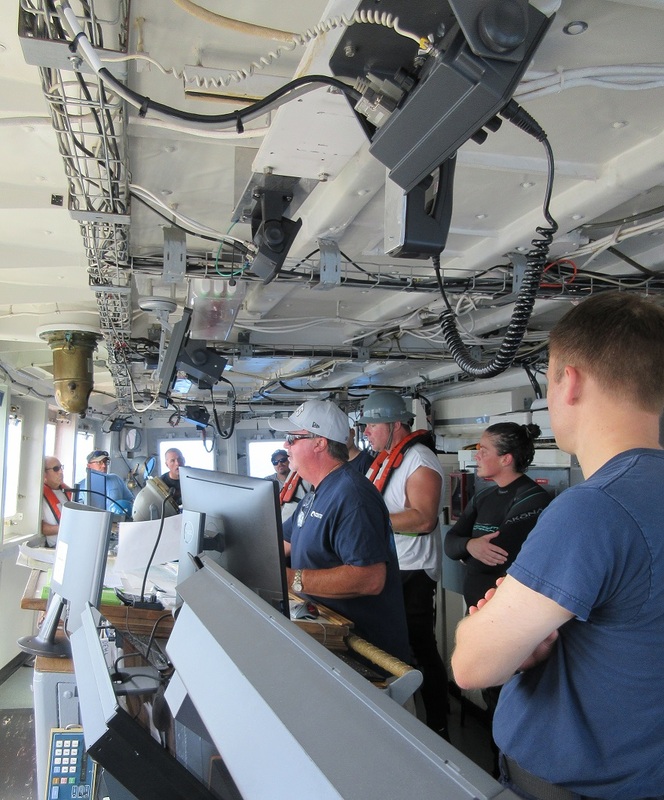 Led by Divemaster Chris Nichols, also the Oregon II’s Lead Fisherman and MedPIC (Medical Person in Charge), the team gathered on the bridge (the ship’s navigation and command center) to conduct a pre-dive safety briefing. Nichols appears in a white t-shirt, near center. 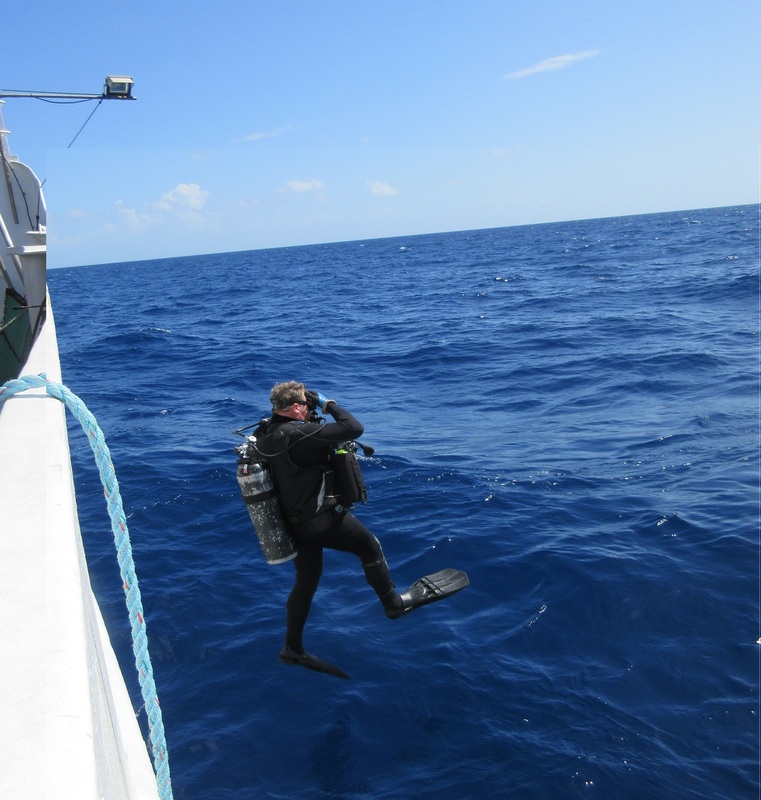 The entire process is not as simple as, “Let’s go check it out!” NOAA divers must follow certain rules and safety regulations. 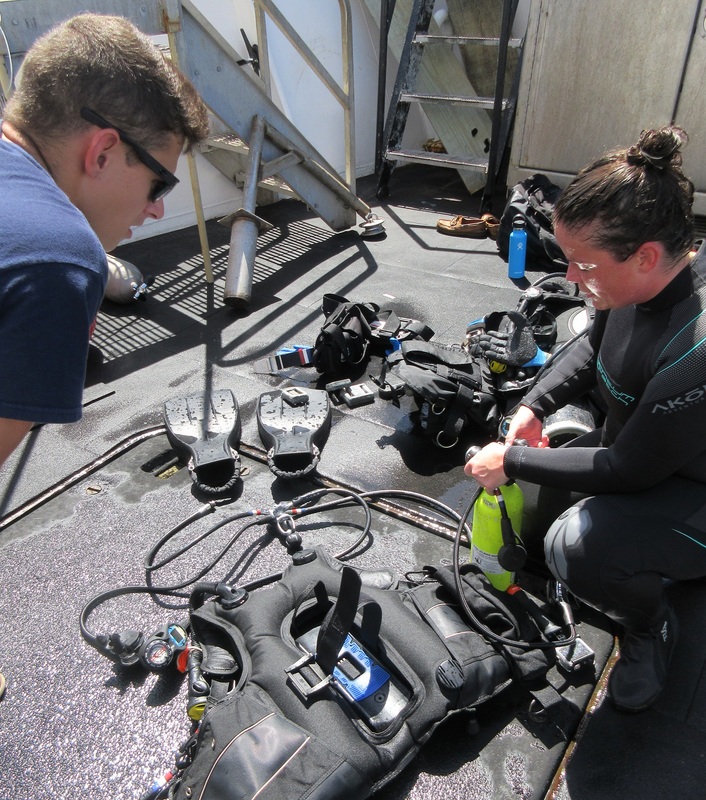 First, the Oregon II’s dive team developed a Dive Operations Plan to investigate the bow thruster and hull. Dive details were discussed in a pre-dive briefing, or meeting. 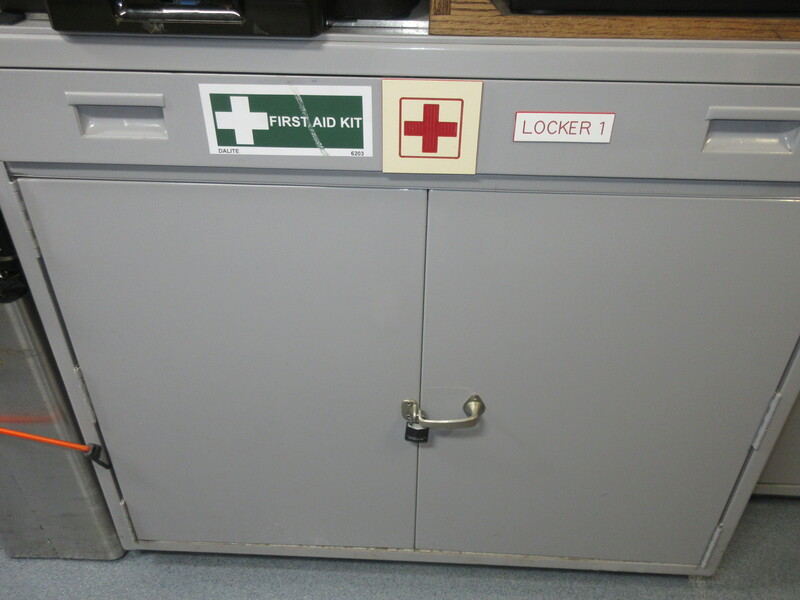 The Diving Emergency Assistance Plan (DEAP) was reviewed and a safety checklist completed. 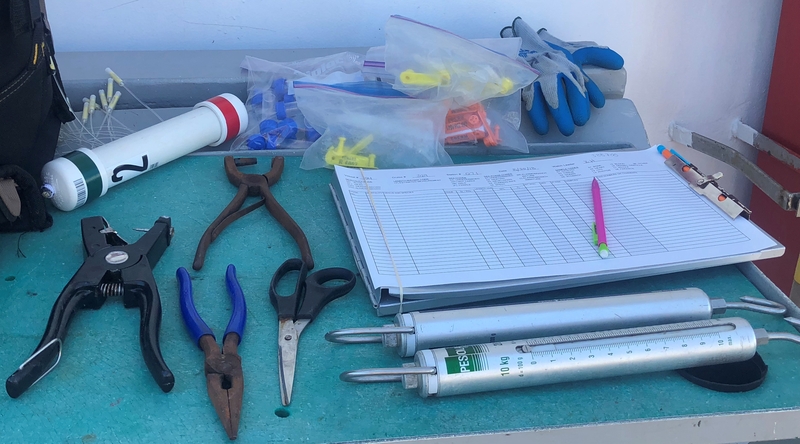 The team prepared to send two divers, Lead Fisherman (LF) Chris Nichols and Navigation Officer Ensign (ENS) Chelsea Parrish, to inspect the bow thruster and remove any fishing line if needed. For this task, they carried scrapers and line-cutting tools. 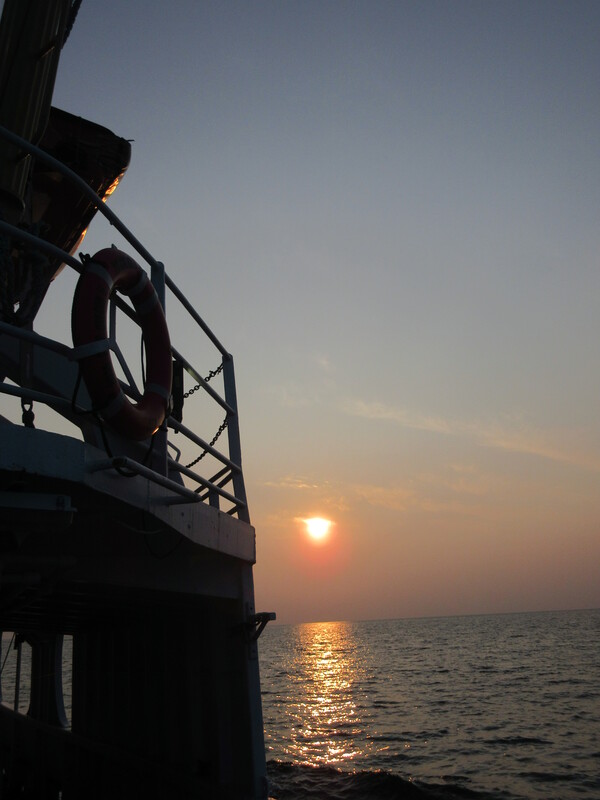 To prepare for the dive operation, ship navigation plans were made. 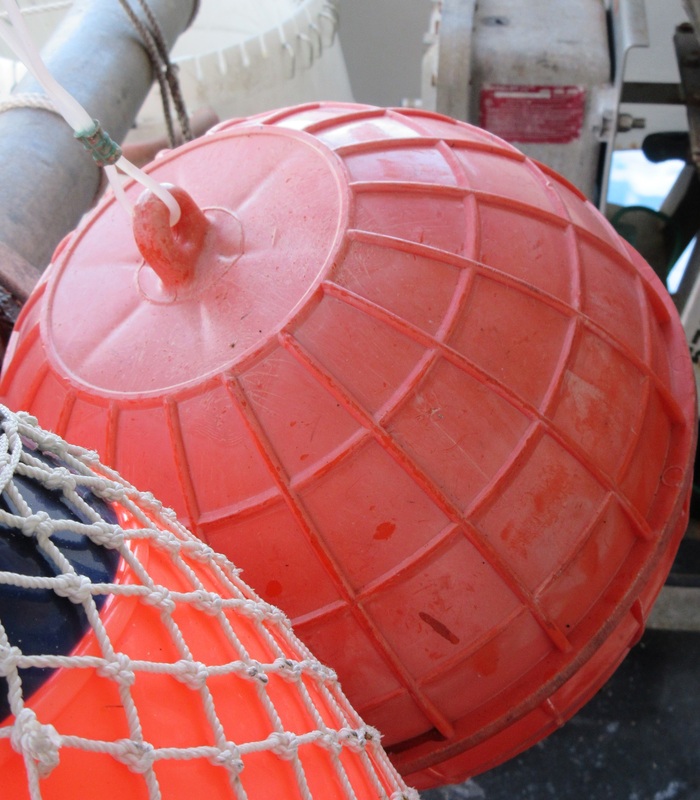 Equipment beneath the boat was secured. This ensured that the divers would be kept safe from any moving parts such as the propeller or rudder. 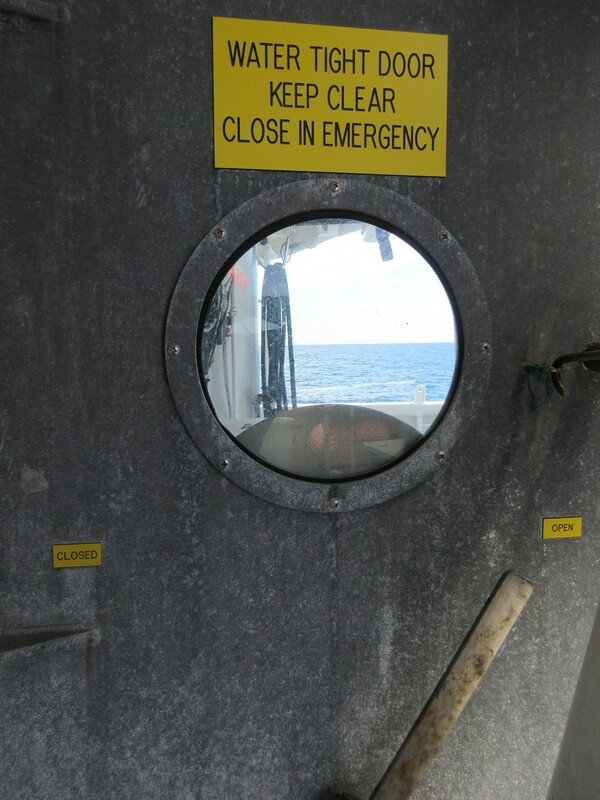 Next, announcements were made before and after the dive to notify the entire ship that divers would be entering and exiting the water. That way, everyone on board knew to stop any fishing activity and avoid putting fishing gear in the water. To let nearby vessels know that divers are in the water, two flags are hoisted. 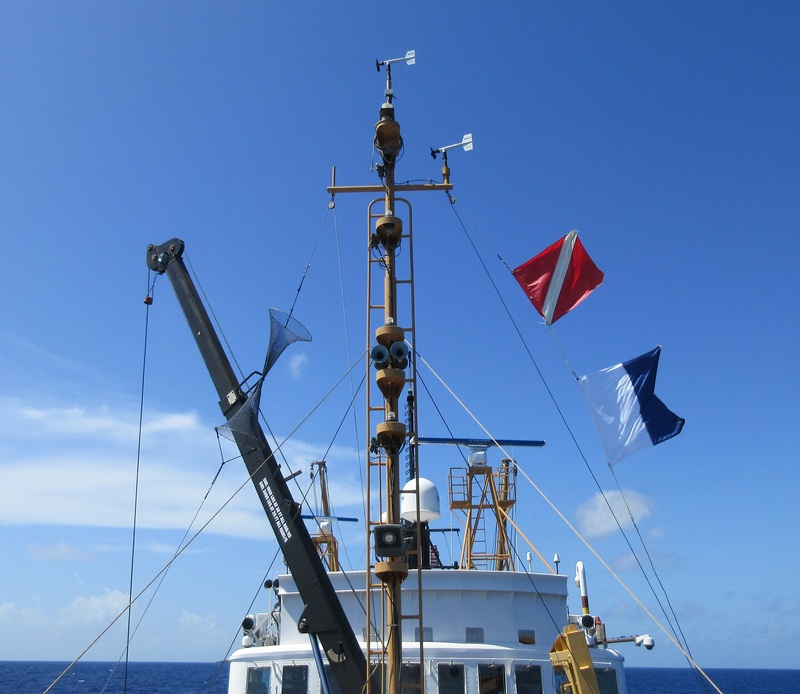 The scuba flag (red and white) indicates “diver down,” and the International Code of Signals flag ‘Alfa’ (blue and white; sometimes spelled ‘Alpha’) lets other vessels know that the ship is engaged in a dive operation. 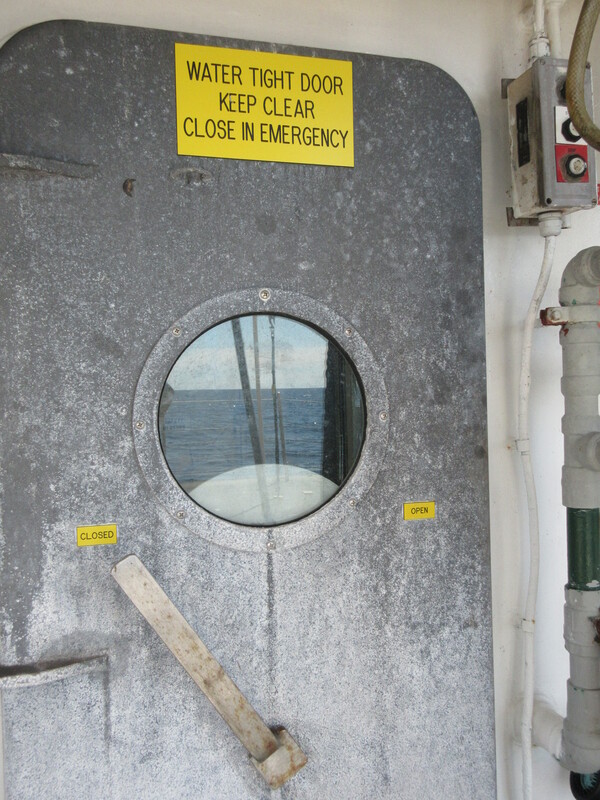 This tells other vessels to ‘keep well clear at slow speed’. 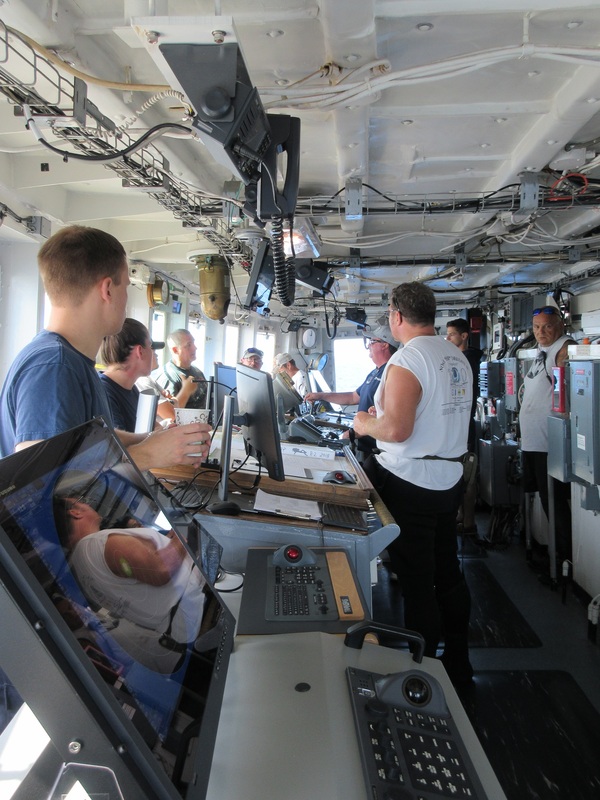 During the pre-dive briefing, procedures were reviewed and agreed upon. If needed, clarifying questions were asked to make sure that everyone knew and understood exactly what to do. This was similar to the ‘Checking for Understanding’ that I do with my students after giving directions. 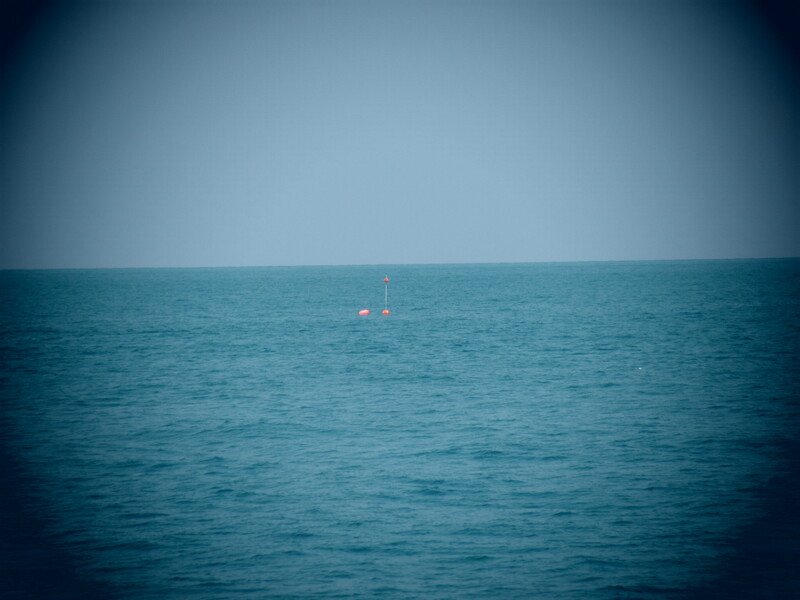 Then the team agreed upon a dive time and a maximum diving depth. In this case, the team planned to dive a maximum of 25 fsw (feet of sea water). The surrounding water was about 160 feet deep. 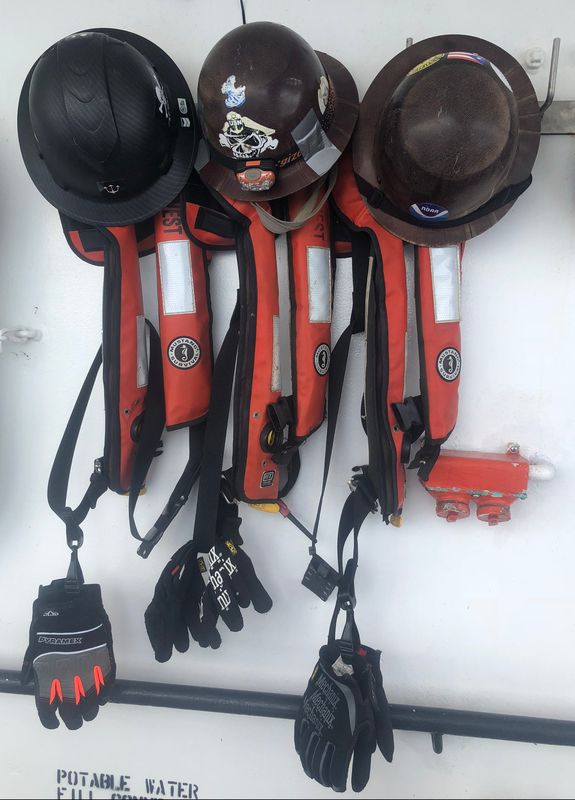 A smaller, 18-foot rigid rescue boat was launched from the Oregon II, prepared to assist the divers in the water if needed. On the deck of the Oregon II, a Topside Supervisor and Line Tender kept watchful eyes on the divers. 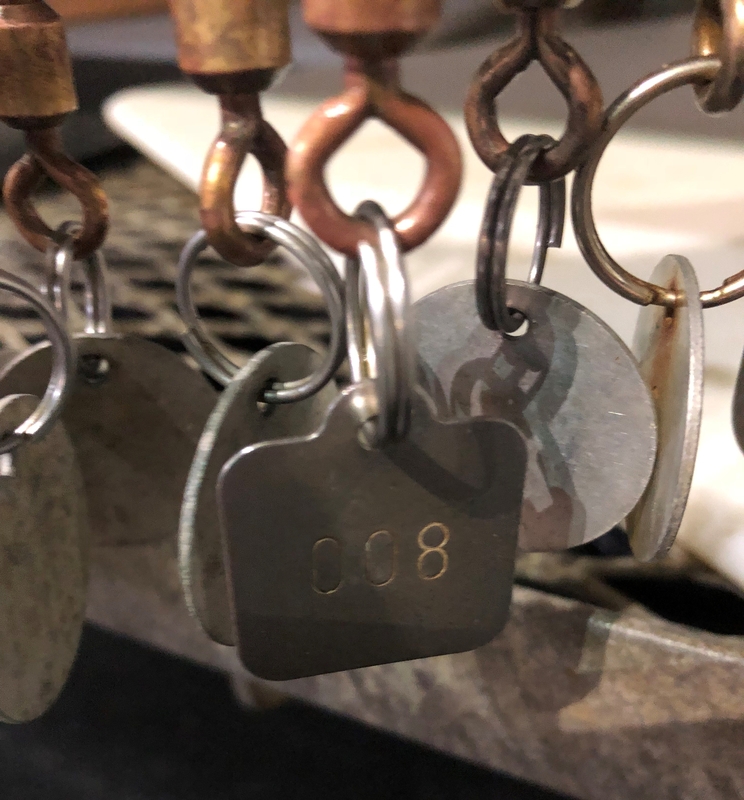 Chief Boatswain (pronounced “boh-suhn”) Tim Martin was the standby diver, prepared to provide immediate assistance to the other divers if needed. 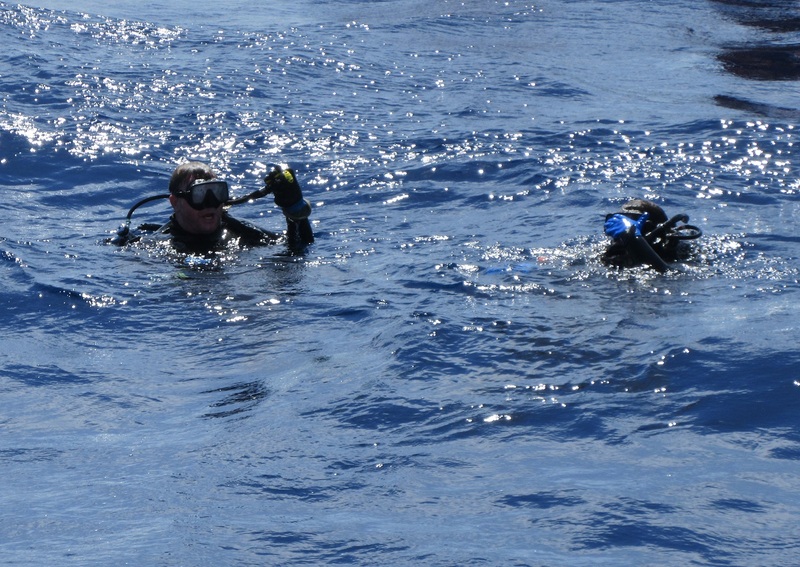 Before entering the water, the divers checked one another’s gear for safety. 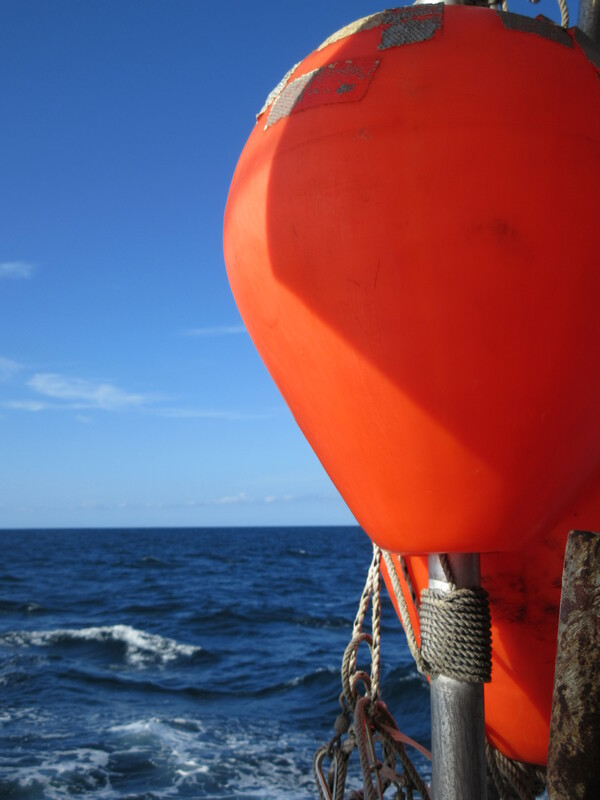 Potential risks and hazards, such as currents, obstacles, and dangerous marine life, were identified ahead of time. 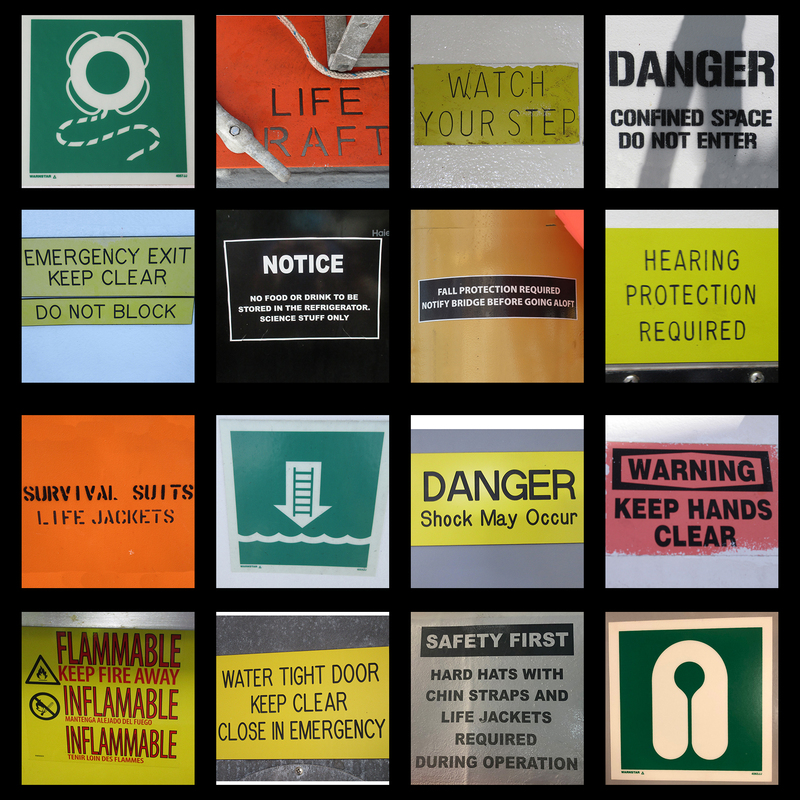 Multiple solutions were in place to minimize or eliminate these risks. Checking equipment before entering the water ensures that divers are prepared. 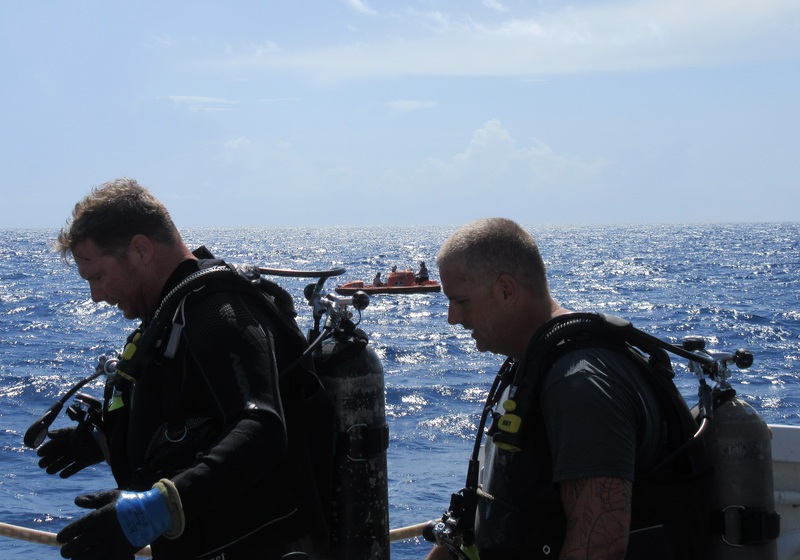 As the divers prepared to enter the water, the rest of the team was equally well prepared with checks, double-checks, back-up plans, communication, and contingency (emergency) plans. 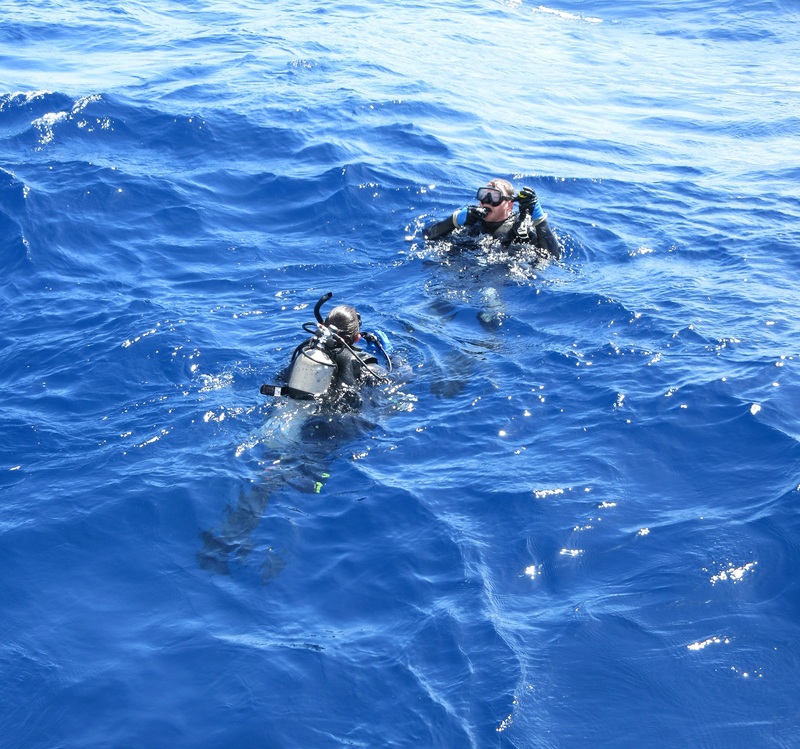 Hopefully, emergency plans are never needed during a dive operation, but just in case, everyone was well-trained and prepared to jump into action. Plans for entry into the water and exit from the water were reviewed in the pre-dive briefing. In this case, Lead Fisherman Chris Nichols entered the water with an entry method called a Giant Stride. Ensign Chelsea Parrish enters the water with a Giant Stride. An exit plan, plus two back-up exit options, were also reviewed beforehand. If needed, the divers had three possible ways to exit the water. The water was calm and the weather fair. The divers signaled to the ship that they were OK in the water, and slipped beneath the surface. Soon, the only trace of them was a lighter blue trail of bubbles. The divers are OK and ready to dive. For breathing under water, the divers used compressed air in tanks. 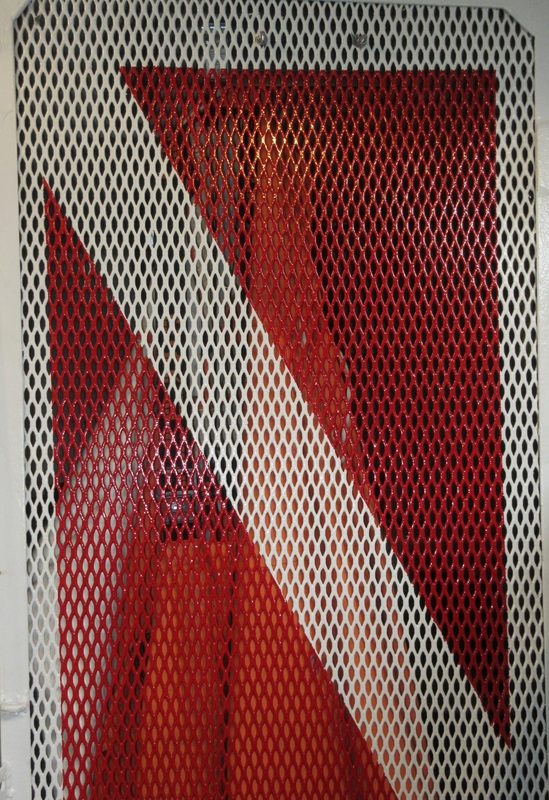 Because this was open circuit scuba (self-contained underwater breathing apparatus) equipment, air bubbles could be seen in the water once they disappeared beneath the surface. 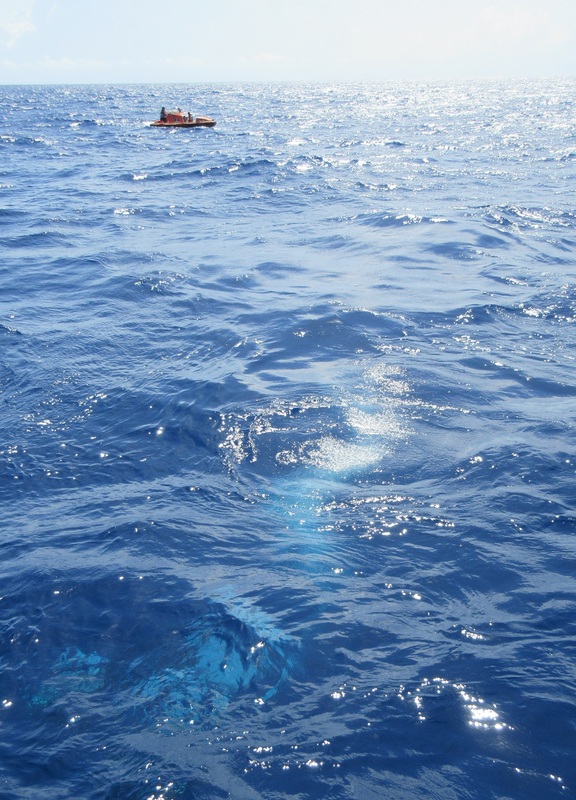 As divers descended, air bubbles could be seen beneath the surface. 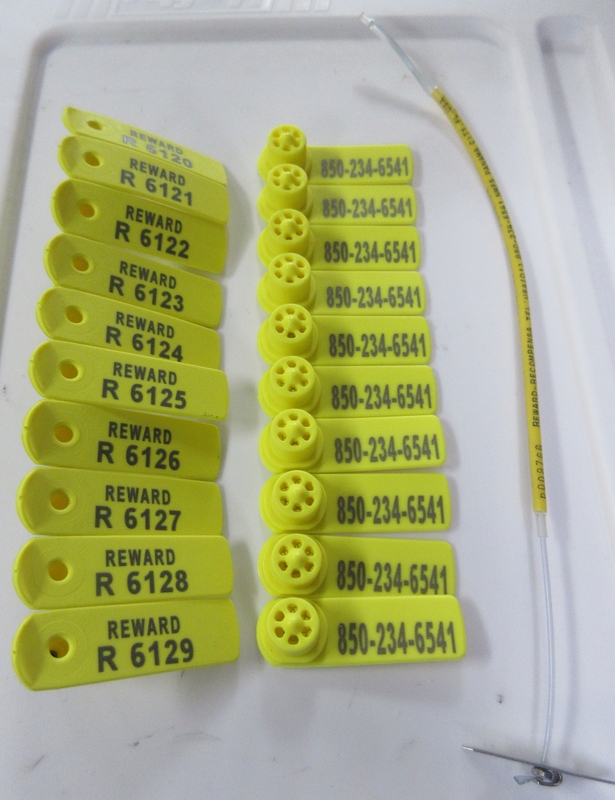 For safety, a Reserve Air Supply System (RASS) was also worn by each diver. This was a working dive. Unlike recreational diving, this was not the time for the divers to leisurely swim and explore, but to follow the plan precisely. To communicate with each other under water, hand signals were used. While in the water, the divers also practiced a ‘sick diver’ drill to rehearse what to do if a diver needed medical attention. Similar to a fire drill or other safety drill, but performed in the water, this was one of several drills performed on the Oregon II. 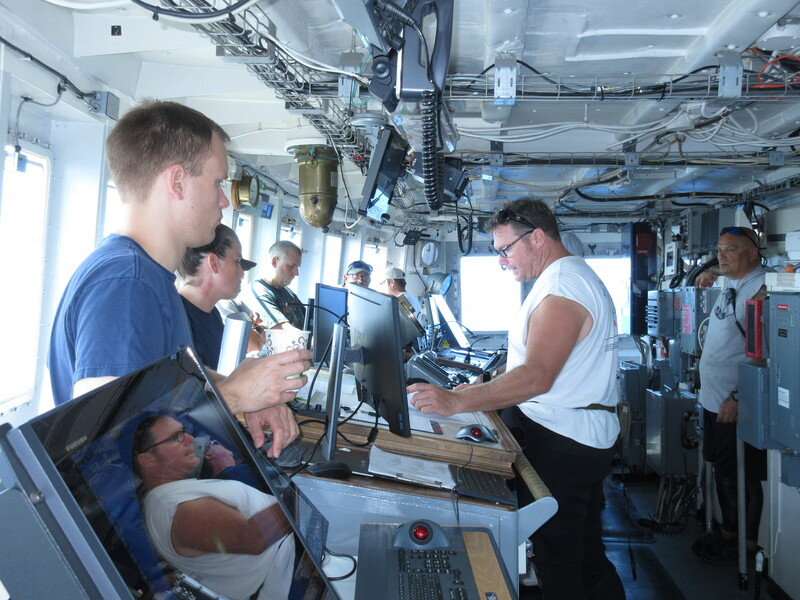 After the dive was completed, a post-dive briefing was held to review and critique the dive operation. The dive team discussed how the dive actually went, in comparison to the dive plan. This was similar to the reflection I do after teaching lesson plans. 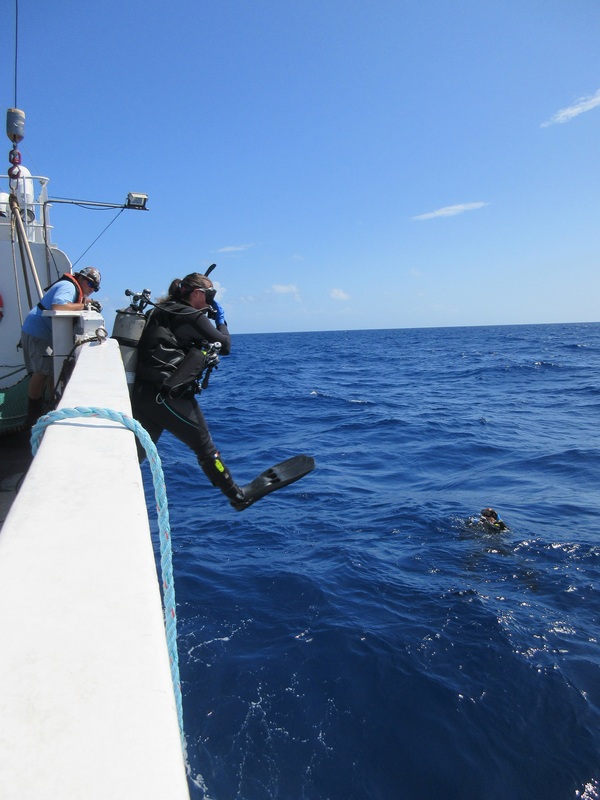 The divers reported back on the condition of the bow thruster and hull, as well as the dive conditions. They discussed their equipment, the undercurrent, and how they felt while under the pressure of the water. Dive data was collected from each diver and recorded on a form. The divers reached a depth of 21 feet. Success! 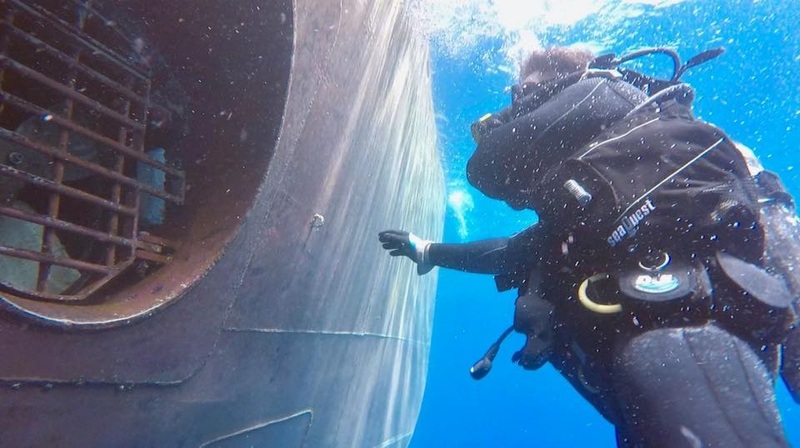 After inspecting the hull, the divers reported that they didn’t see any fishing line on the bow thruster or damage to the hull. Instead, they saw some small fish called jacks and some moon jellies drifting by. Finally, the scuba equipment is removed and rinsed with fresh water. Once dry, it will be carefully stowed away until the next dive. Dive operations don’t happen often on the Oregon II. Normally, the team practices and performs their dives in a swimming pool in Mobile, Alabama. This dive near the Florida Keys was the first at-sea operational dive in two years as a full team—a rare and exciting treat to witness! This reflection captures my own dive into the world of longline fishing. Switching roles from educator to student, this is also where I transition from writing for my students to writing for my peers and colleagues. Every time I attempt something brand new, some optimistic part of me hopes that I’ll be a natural at it. If I just try, perhaps I’ll discover some latent proclivity. Or perhaps I’ll find my raison d’être—the reason why I was placed on this planet. So I try something new and quickly recognize my naïveté. Many of these new skills and sequences are difficult, and I’m slow to master them. I compare my still-developing ability to that exhibited by seasoned veterans, and I feel bad for not grasping it quickly. Spoiler alert: Longline fishing may not be my calling in life. Life on and around the water, however, suits me quite well. 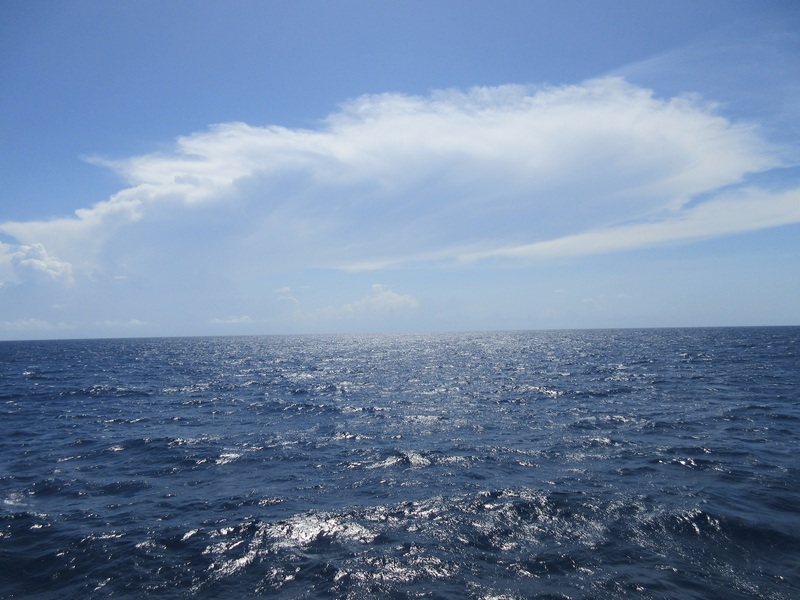 As I’ve acclimated to life on a ship, the very act of being at sea comes naturally. Questions and curiosity flow freely. An already-strong appreciation for the water and its inhabitants deepens daily. And while I may not learn new concepts quickly, I eventually learn them thoroughly because I care. 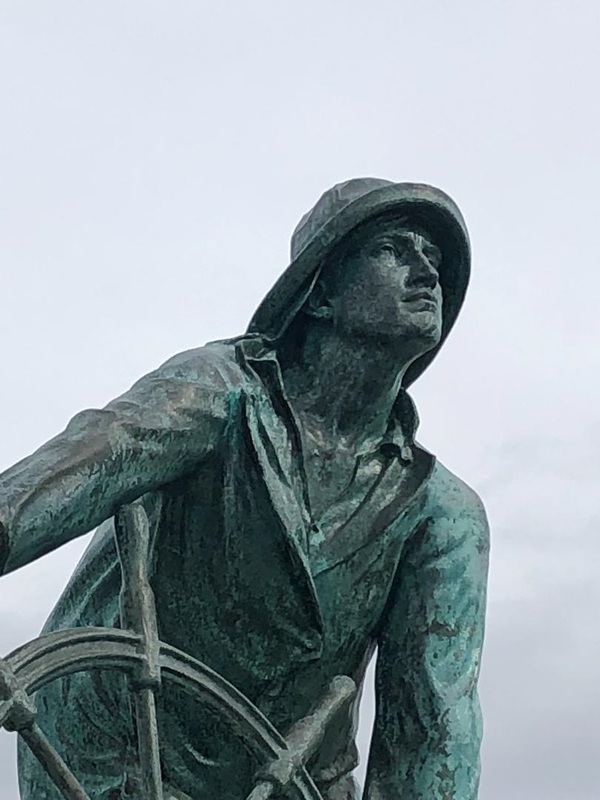 This journey has been a culminating opportunity in which I’ve been able to apply the nautical knowledge and marine biology fun facts I’ve been collecting since childhood. Much of the daily work is rote, best learned through repetition, muscle memory, and experience. 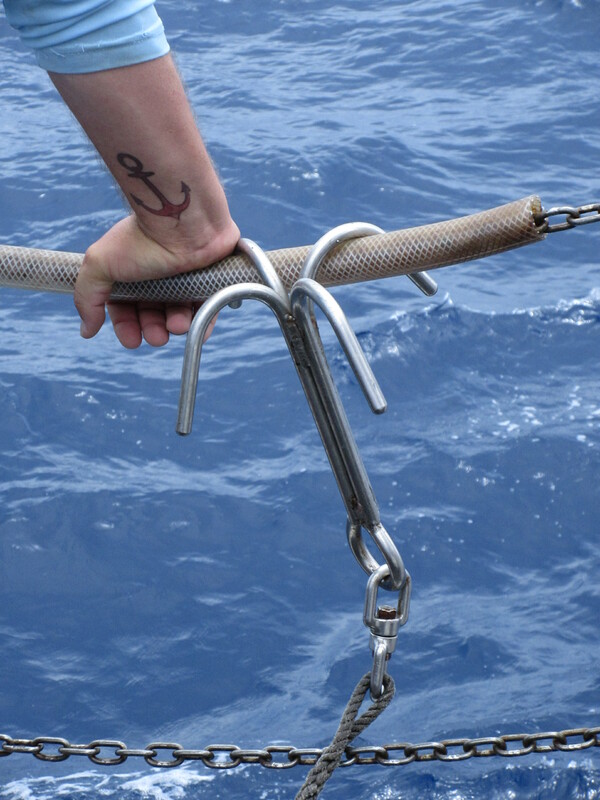 Very little of it is intuitive or commonsense, and my existing nautical know-how isn’t transferable to the longline gear because I’ve never handled it before. 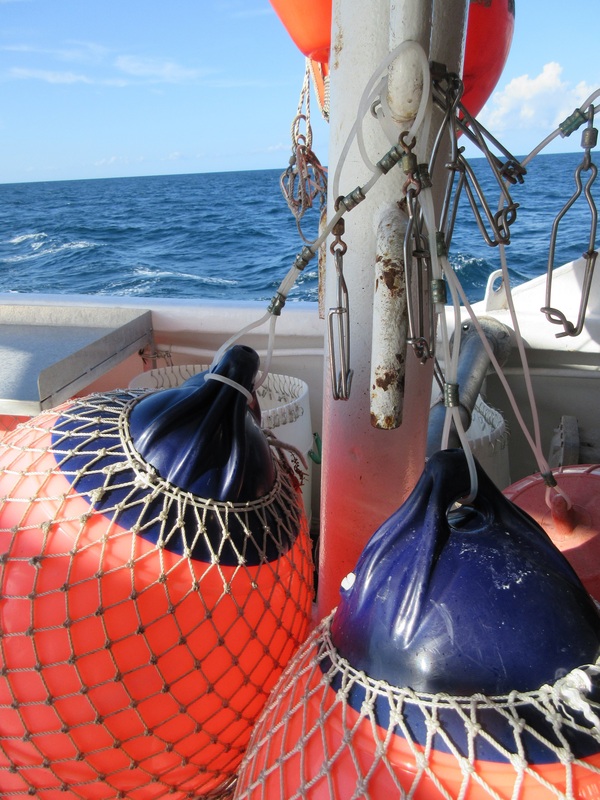 Additional buoys are sometimes added to the mainline. At first, making sense of the various steps and equipment used in longline fishing felt like a jumbled, tangled barrel of gangions. 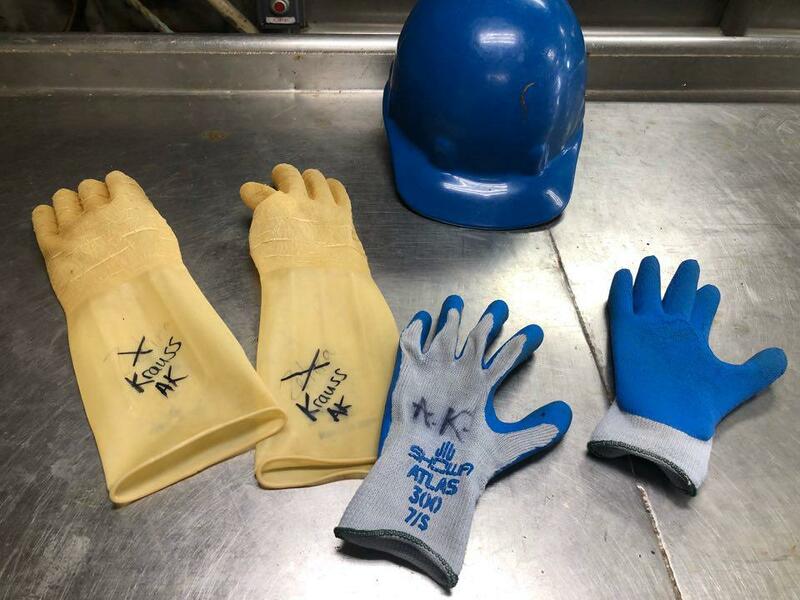 At any point during my twelve hour shift, I’m keeping track of: the time, several other people, several locations on the ship, my deck boots (for working outside), sneakers (for walking inside), personal flotation device (PFD), sun hat, hard hat, bait gloves (for setting bait on hooks), grippy work gloves (for handling equipment and slippery, slimy fish), water bottle, camera, and rain gear…not to mention the marine life and specialized equipment for the particular task we’re performing. The longline gear is deployed off the stern. Somewhere, Mr. Rogers is feeding his fish and chuckling with approval every time I sit down to swap out my deck boots several times a day. Swapping out my sneakers for deck boots…again. There’s a great deal of repetition, which is why it’s so frustrating that these work habits haven’t solidified yet. It should be predictable, but I’m not there…yet. Researchers believe it takes, on average, more than two months before a new behavior becomes automatic. Maybe I’m being hard on myself for not mastering this in less than two weeks. Unlatch the door. Relatch the door. Fill water bottle. Sunscreen on. Sneakers off. Boots on. Boots off. Sneakers on. Bait gloves on. Bait gloves off. Work gloves on. Work gloves off. Regular glasses off. Sunglasses on. Sunglasses off. Refill water bottle. Regular glasses on. Unpack the tool bag. Repack the tool bag. Hat on. Hat off. Repeat sunscreen. Refill water bottle. PFD on. PFD off. Hard hat on. Hard hat off…and repeat. 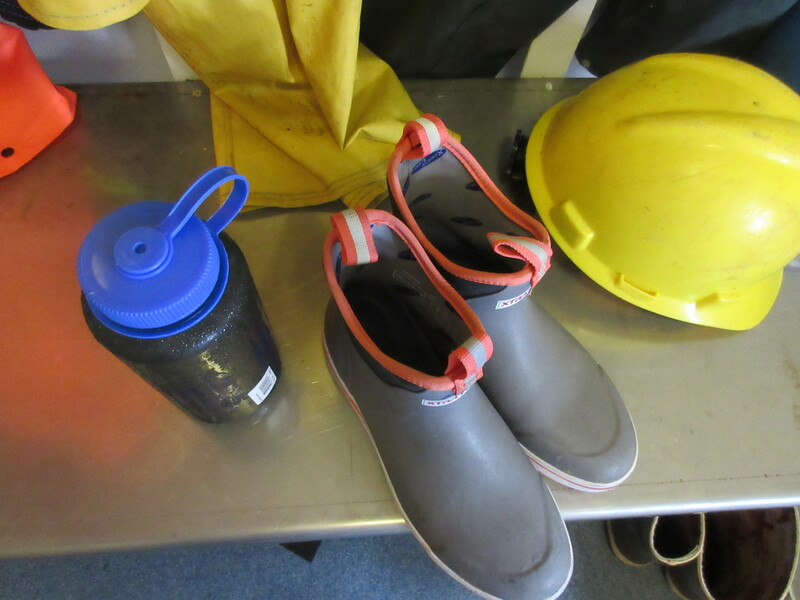 It seems simple enough in writing, but I struggle to remember what I need to be wearing when, not to mention the various sub-steps involved in longline fishing and scientific research. 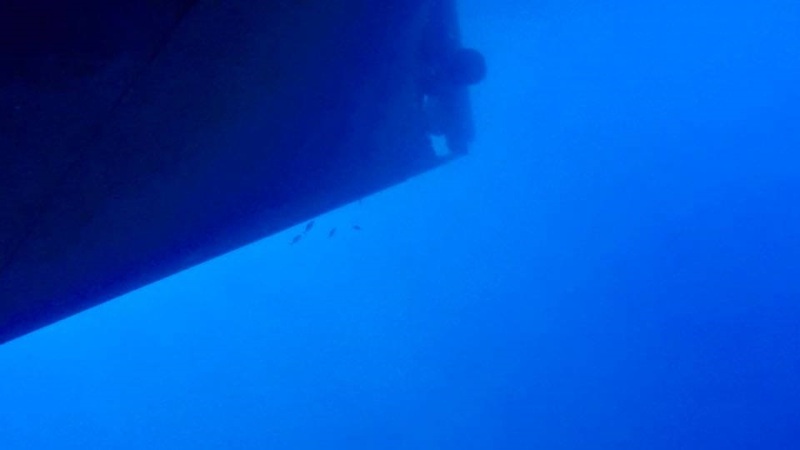 During the dive operation, I ventured up to the bow for a better vantage point. Alone on the bow, glorious water teemed with fascinating marine life as far as I could see. 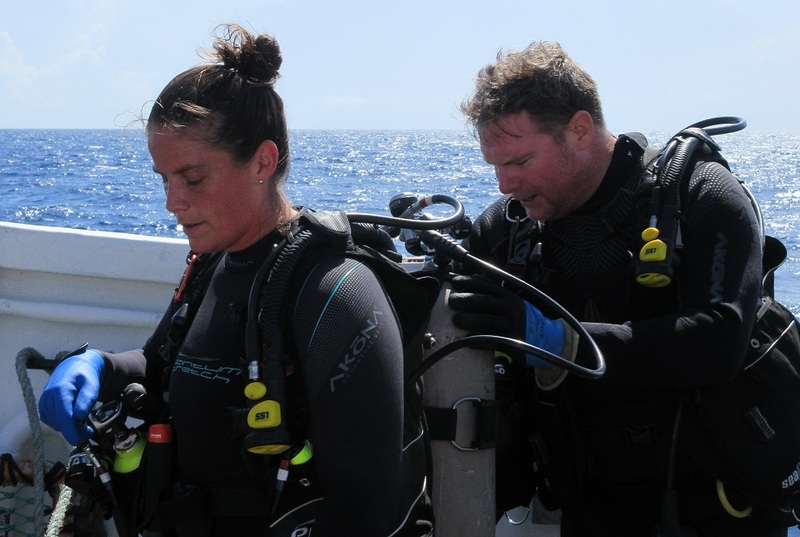 Below me—and well below the surface—an actual dive operation was taking place: an opportunity to apply the diving knowledge I’ve absorbed and acquired over the past several years. As I struggle to keep track of all of the routines, equipment, and fishing gear, I feel like Maria in the opening scene of The Sound of Music. Lost in reverie and communing with nature, she suddenly remembers she’s supposed to be somewhere and rushes off to chapel, wimple in hand. She’s supposed to be wearing it, of course, but at least she made it there and remembered it at all. And then I remembered that my shift was starting soon, so I dashed off, PFD in hand. I know that I’ll need a PFD at some point. And my gloves. And my boots. And a hard hat. I have them all at the ready, but I’m not always sure which one to wear when. As I fumble through the transitions, routines, and equipment, I sympathize with Maria’s difficult search for belonging. I certainly mean well, and my appreciation for the water around us cannot be contained. 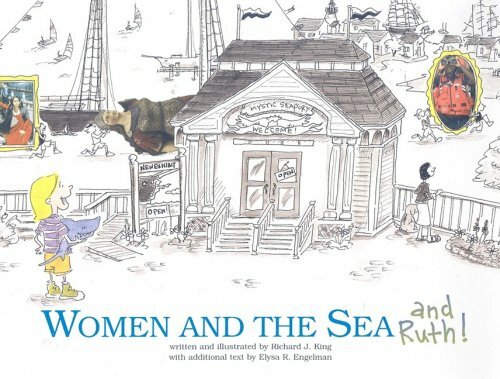 Eventually, Maria realizes that she’s better suited to life as a governess and later, a sea captain’s wife. I’m discovering that perhaps I was not destined to be a skilled longline fisherman, but perhaps there is some latent proclivity related to the life aquatic. 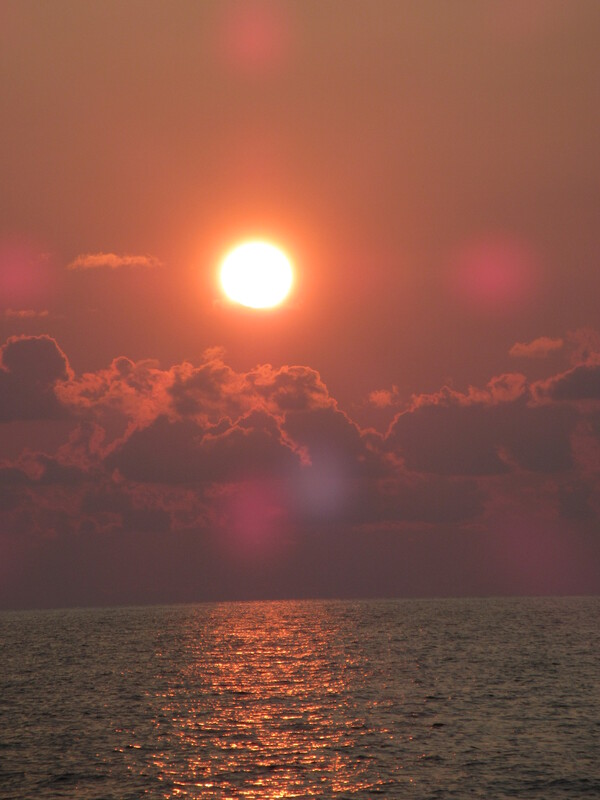 I may not always know which equipment to use when, but I know—with certainty—that I definitely need the ocean. 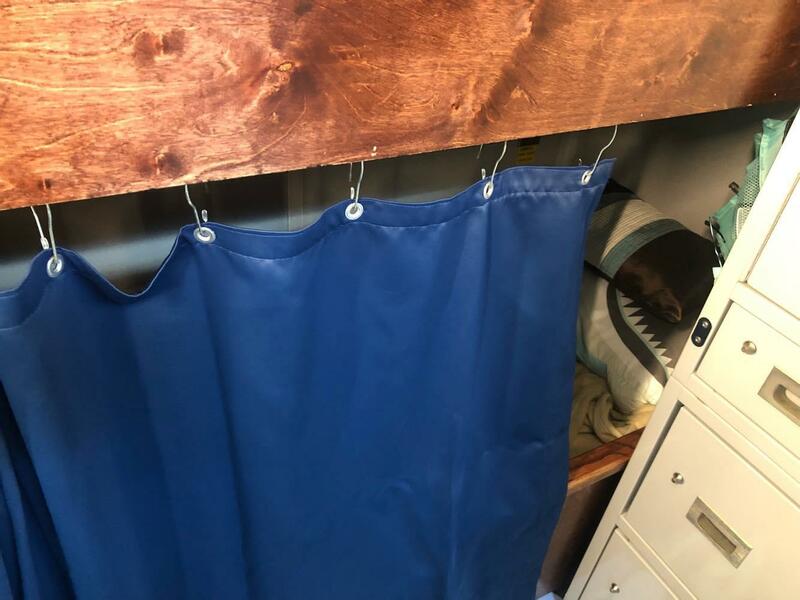 Taking a curtain cue from Maria, perhaps I could fashion a dress or a wetsuit from the curtains hanging near my berth…? 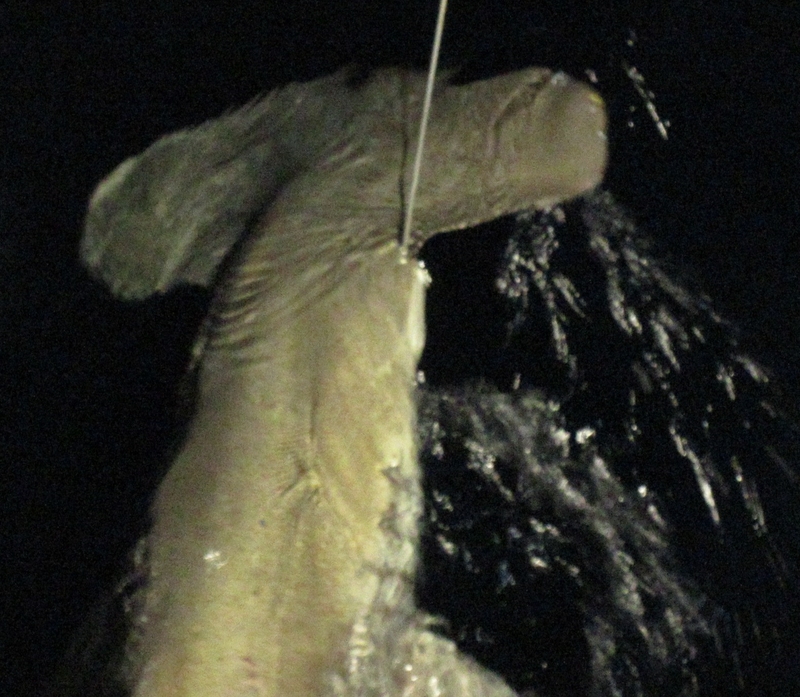 Sharks secrete a type of mucus, or slime, from their skin. The mucus provides protection against infection, barnacles, and parasites. It also helps sharks to move faster through the water. Ship builders are inspired by sharks’ natural ability to resist biofouling and move through the water efficiently. 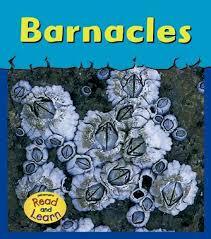 Students may be surprised to learn that barnacles are not only marine animals, but they begin their life as active swimmers and later attach themselves permanently to a variety of surfaces: docks, ships, rocks, and even other animals. Barnacles by Lola M. Schaefer is part of the Musty-Crusty Animals series, exploring how the animal looks and feels, where it lives, how it moves, what it eats, and how it reproduces. 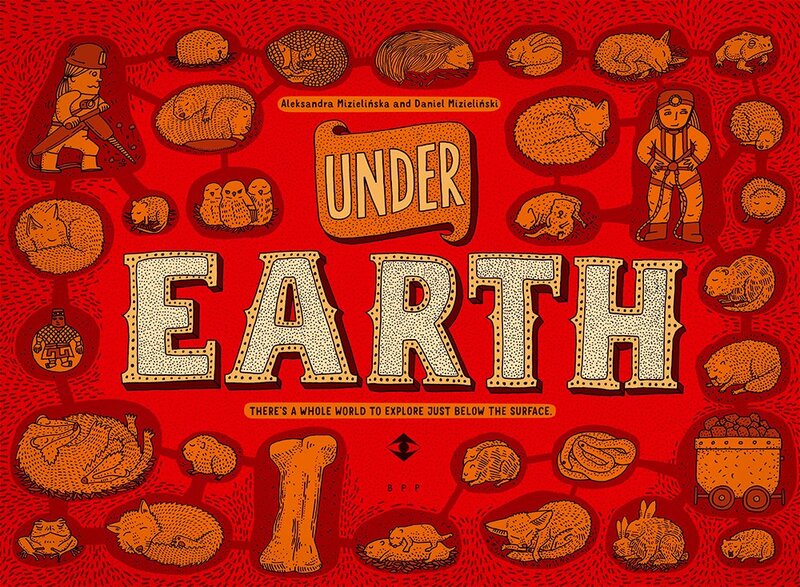 This title is part of Heinemann’s Read and Learn collection of nonfiction books for young readers. Other creatures in the series include: crayfish, hermit crabs, horseshoe crabs, lobsters, and sea horses. 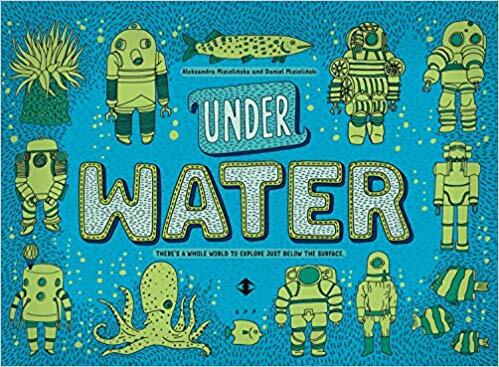 These books are a great introduction to nonfiction reading skills and strategies, especially for younger readers who are interested in fascinating, unconventional creatures. Each chapter begins with a question, tapping into children’s natural curiosity and modeling how to develop and ask questions about topics. Supportive nonfiction text features include a table of contents, bold words, simple labels (as an introduction to diagrams), size comparisons, a picture glossary, and index. 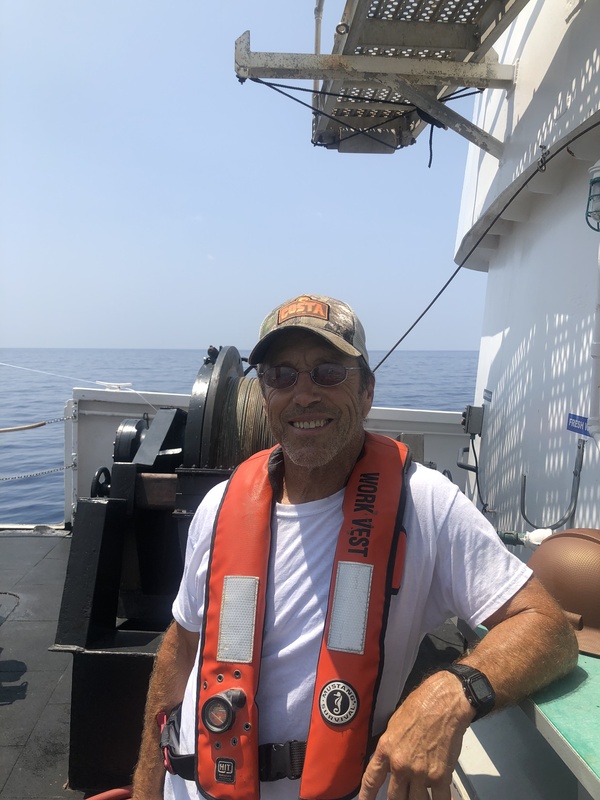 I’m thrilled to be joining NOAA Ship Oregon II for the second leg of the Shark/Red Snapper Longline Survey. The adventure of a lifetime begins in Canaveral, Florida and concludes in Pascagoula, Mississippi. 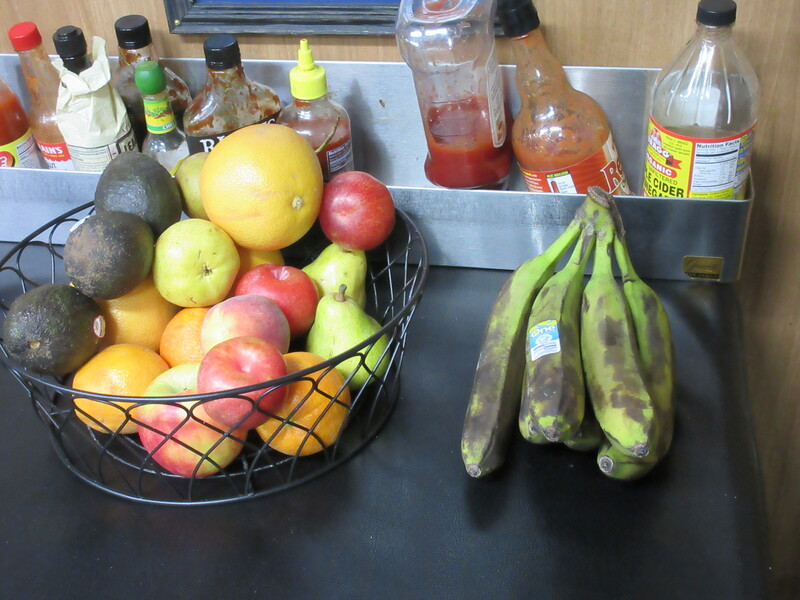 For two weeks, we’ll be studying sharks, red snapper, and other marine life in the Atlantic Ocean and Gulf of Mexico. 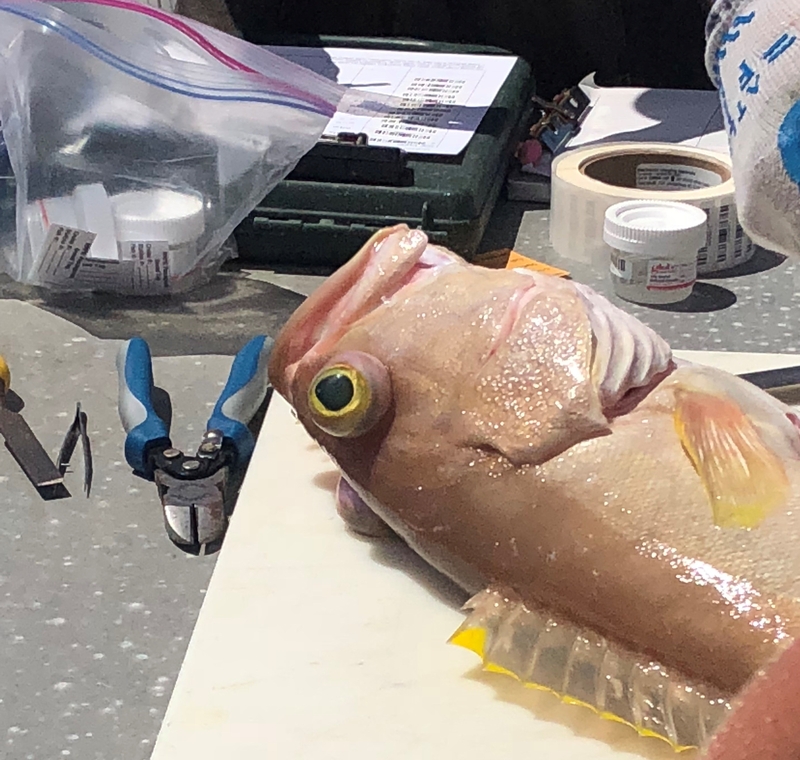 Scientists will collect data on fish populations to find out more about their distribution, age, weight, length, reproduction, and other important information. Along the way, we’ll also sample water quality and collect other environmental data. Learning more about these creatures and their surroundings can help to keep their habitats safe and thriving. 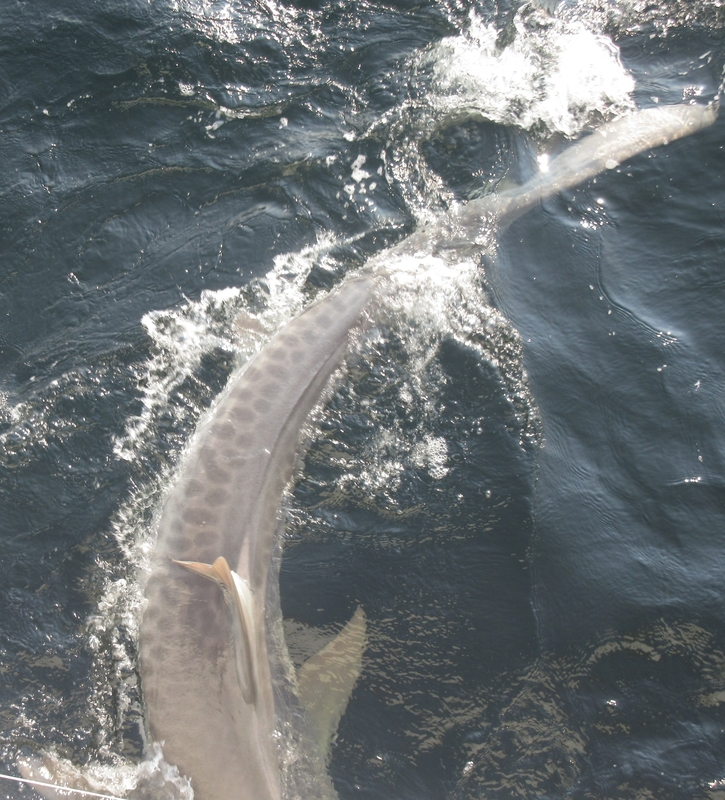 This exciting opportunity is the next chapter in my lifelong appreciation for sharks and the sea. 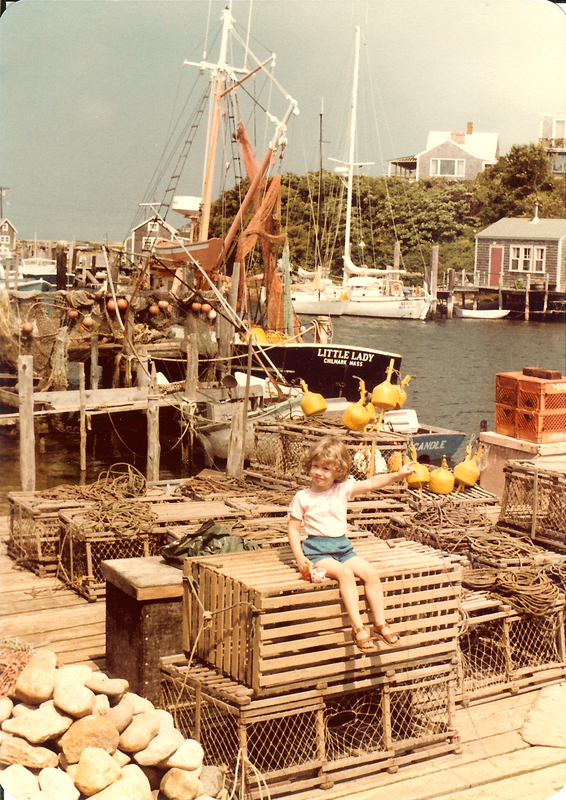 During a formative visit to the ocean at age three, I quickly acquired a taste for salt water, seafaring, and sharks. I saw my first shark, a hammerhead, in the New England Aquarium, and I was transfixed. I wanted to know everything about the water and what lived beneath the surface. Enthralled by the ocean at age three. This trip launched a lifelong love of New England. Revisiting the same beach as an adult…still enthralled. I had the same reaction when I found out I was selected for Teacher at Sea! After discovering nonfiction in fourth grade, I could access the depths through reading. I was riveted to books about deep-sea creatures and pioneering undersea explorers. The more I learned, the more curious I became. As a younger student, I never indulged my aquatic interests in any formal academic sense beyond prerequisites because of my epic, giant-squid-versus-whale-like struggle with math. Because I was much stronger in humanities and social sciences, I pursued a predictable path into writing, literature, and education. As a Literacy Specialist, I support developing readers and writers in grades K-5 by providing supplemental Language Arts instruction (Response to Intervention). 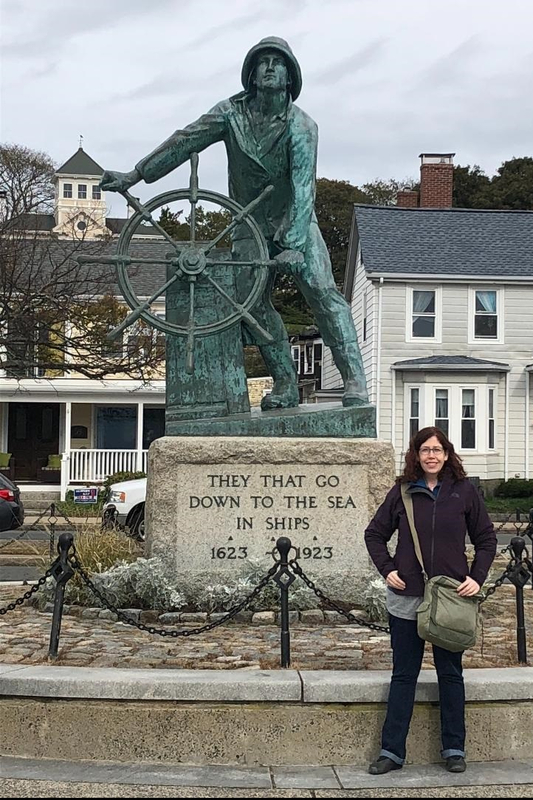 To motivate and inspire my students, I share my zeal for the ocean, incorporating developmentally appropriate topics to teach requisite Language Arts skills and strategies. In 2011, I initiated an ocean literacy collaboration with undersea explorer Michael Lombardi and Ocean Opportunity Inc. so that I could better answer my students’ questions about marine science careers and marine life. Our first meeting involved swimming with blue sharks offshore, and I knew I needed more experiences like that in my life. 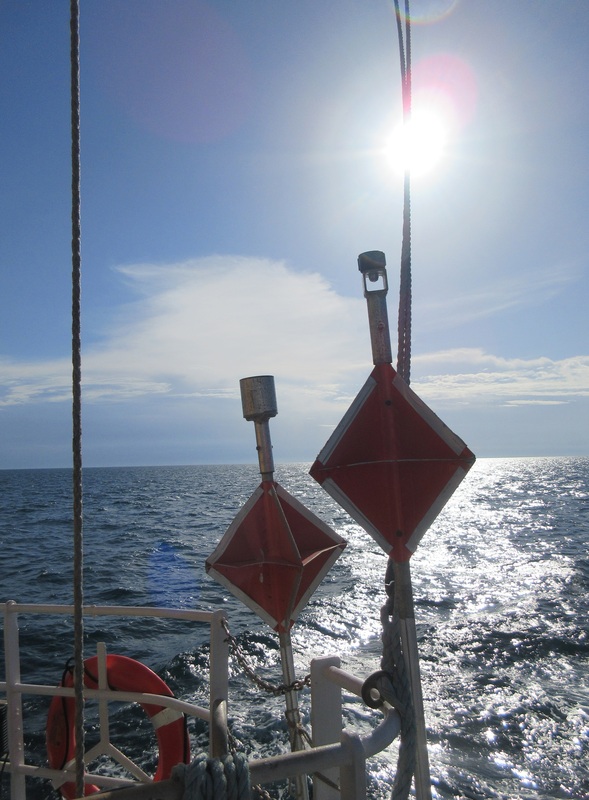 From chumming to helping with the equipment to observing pelagic sharks without a cage, I loved every aspect. 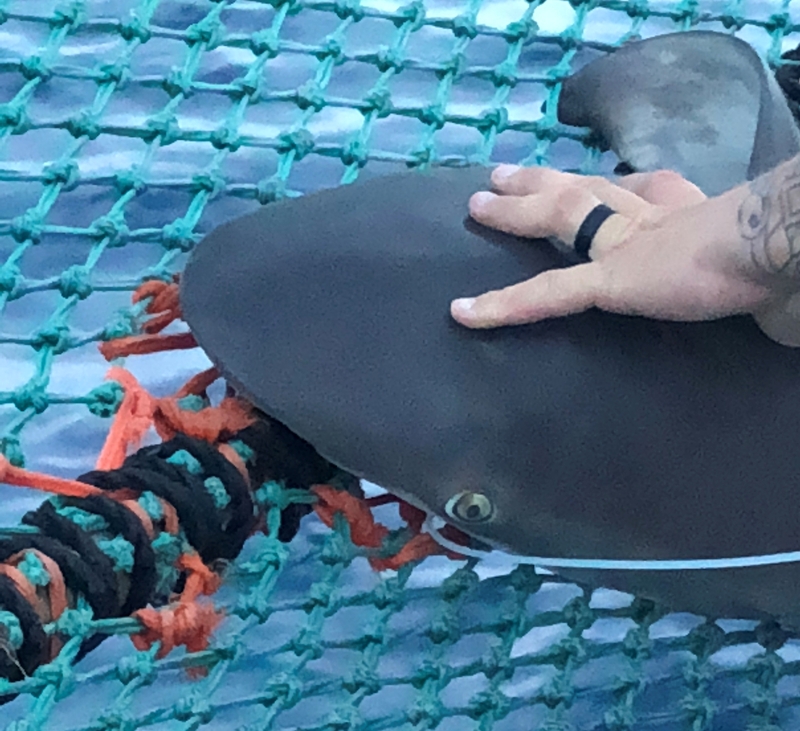 This life-changing experience (both the collaboration and the shark encounter) transformed my instruction, reigniting my curiosity and ambition. Our educator-explorer partnership has inspired and motivated my students for the past seven years. 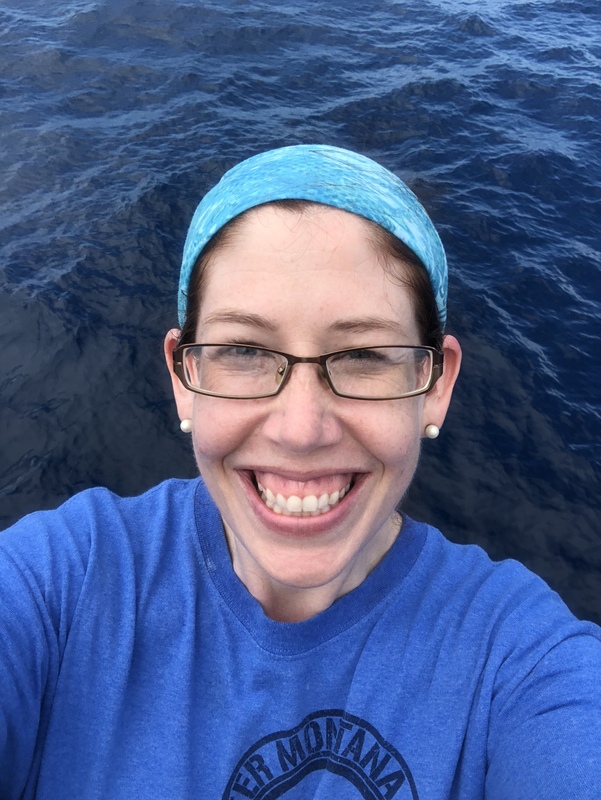 After supporting and following my colleague’s field work with my students, I wanted a field experience of my own so that I can experience living, researching, and working at sea firsthand. 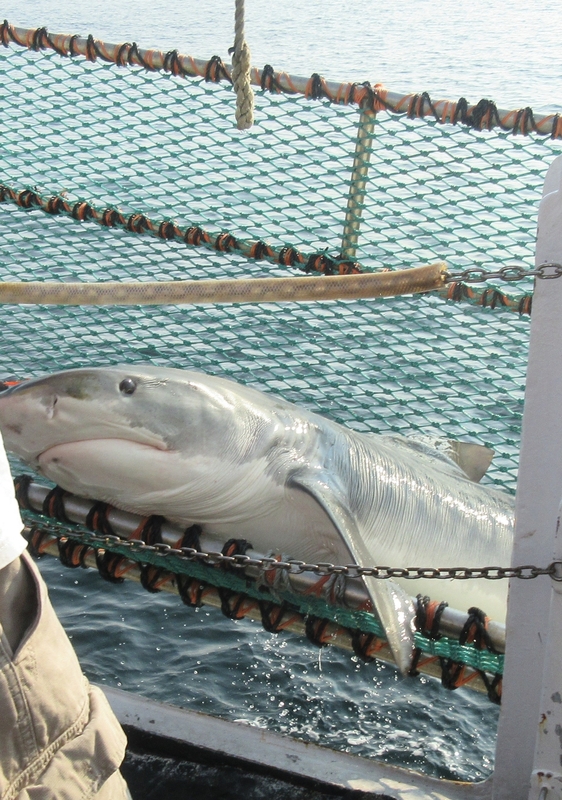 The only time I was in the shark cage. Although my fascination with all things maritime began at an early age, working closely with someone in the field transformed my life. Instead of tumbling, I feel like Alice plunging into a watery wonderland, chasing after a neoprene-clad rabbit to learn more. 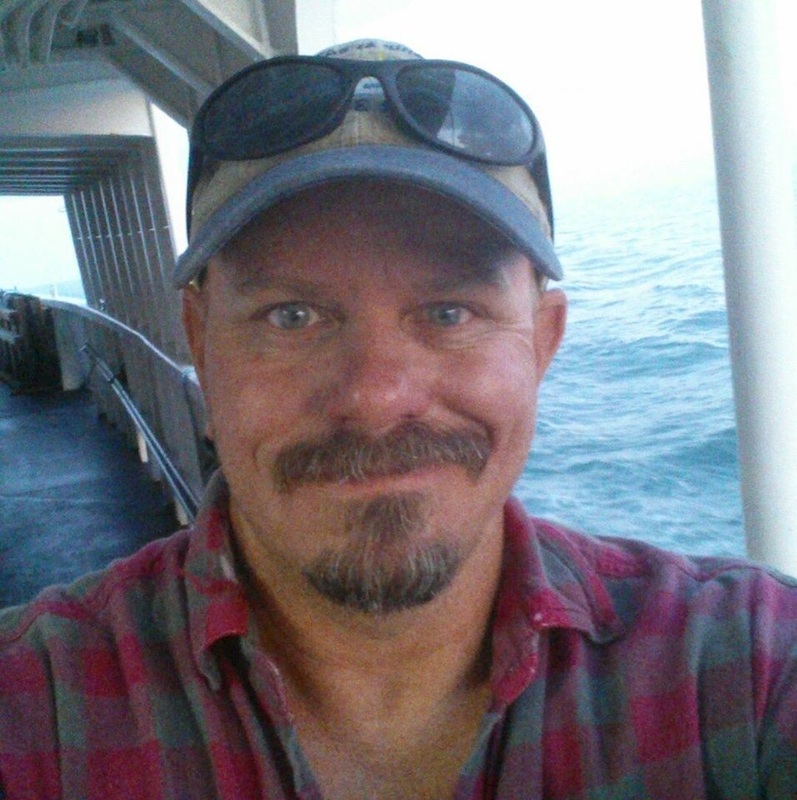 Finding someone who was willing to share their field experience and make it accessible gave me the confidence to revisit my childhood interests through any available, affordable means: online courses, documentaries, piles of nonfiction books, social media, workshops, symposiums, aquaria, snorkeling, and the occasional, cherished seaside visit. We co-authored and published a case study about our collaboration in Current: The Journal of Marine Education, the peer-reviewed journal of the National Marine Educators Association (Fall/Winter 2016). We wrote about bringing the discovery of a new species of mesophotic clingfish to fourth and fifth grade struggling readers. 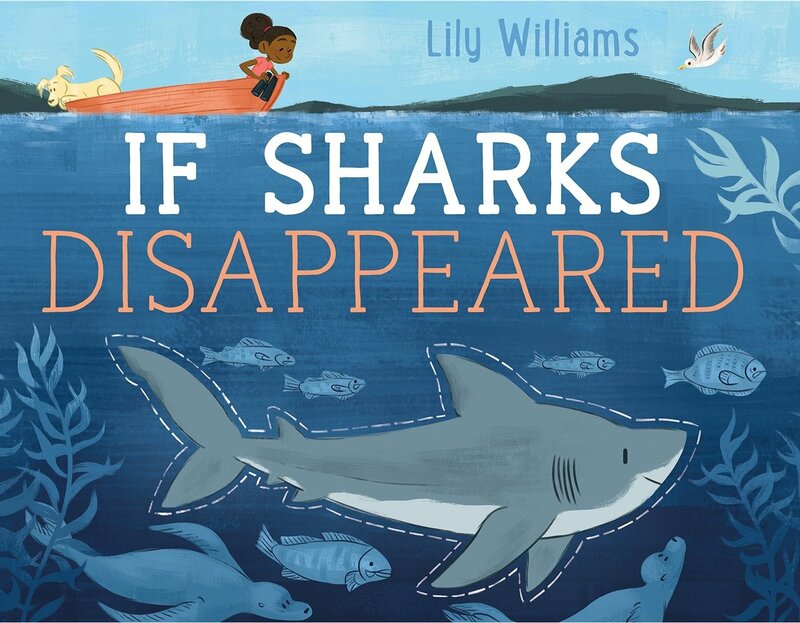 Since a student-friendly text about the fish did not exist, I wrote one for my students at their instructional reading level, incorporating supportive nonfiction text features. It’s reinvigorating to switch roles from teacher to student. Ultimately, this unconventional path has made me a more effective, empathetic educator. My students witness how I employ many of the same literacy skills and strategies that I teach. By challenging myself with material outside my area of expertise, I am better able to anticipate and accommodate my students’ challenges and misconceptions in Language Arts. When comprehension of a scientific research paper does not come to me easily on the first, second, or even third attempt, I can better understand my students’ occasional reluctance and frustration in Language Arts. At times, learning a different field reminds me of learning a second language. Because I’m such a word nerd, I savor learning the discourse and technical terminology for scientific phenomena. 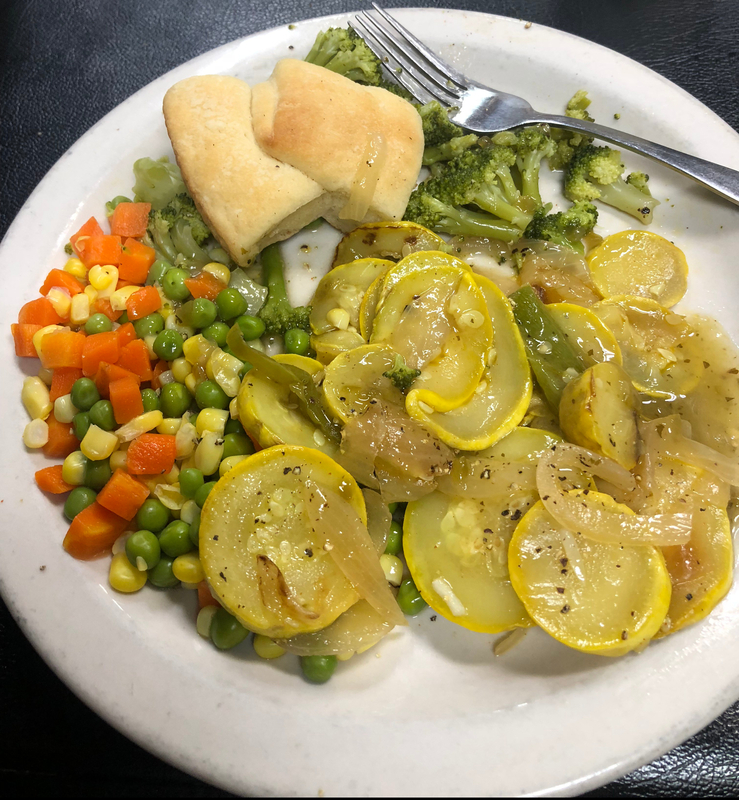 Acquiring new content area vocabulary is rewarding and delicious. It requires word roots and context clues (and sometimes, trial and error), and I model this process for my students. 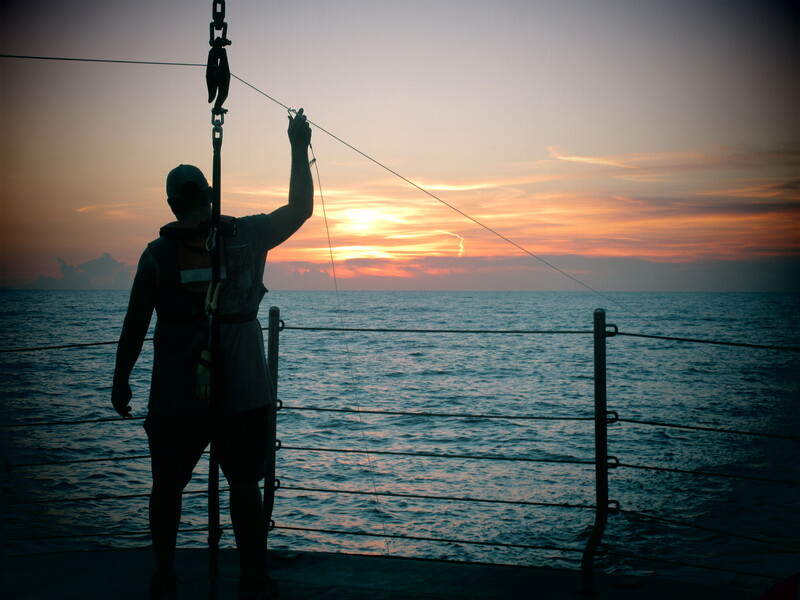 Being selected for Teacher at Sea is an incredible opportunity that required determination, grit, and perseverance. Although my curiosity and excitement come very naturally, the command over marine science content has not. I’ve had to be an active reader and work hard in order to acquire and understand new concepts. Sometimes, the scientific content challenges me to retrain my language arts brain while simultaneously altering my perception of myself as a learner. 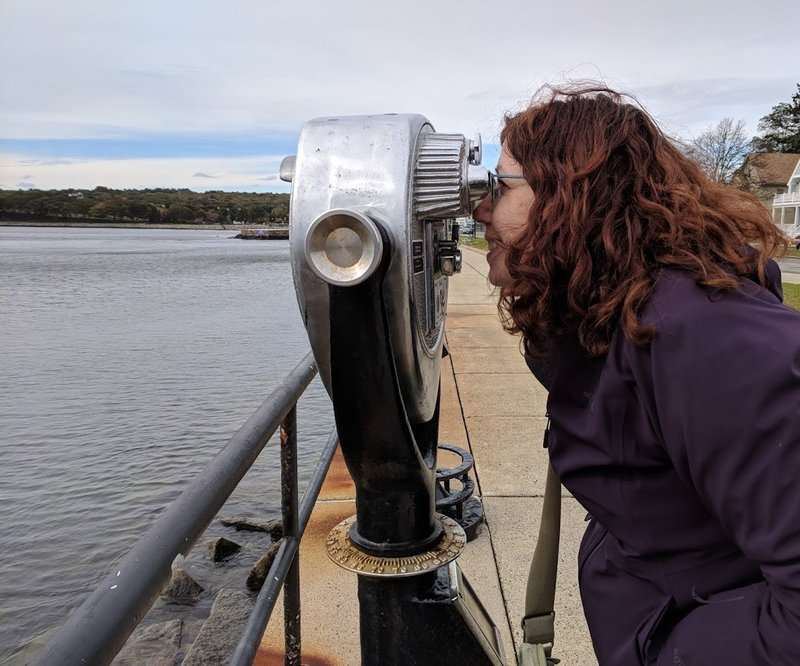 Ultimately, that is what I want for my students: to see themselves as ever-curious, ever-improving readers, writers, critical thinkers, and hopefully, lifelong learners. I am so grateful for the opportunities to learn and grow. I deeply appreciate the support, interest, and encouragement I’ve received from friends, family, and colleagues along the way. 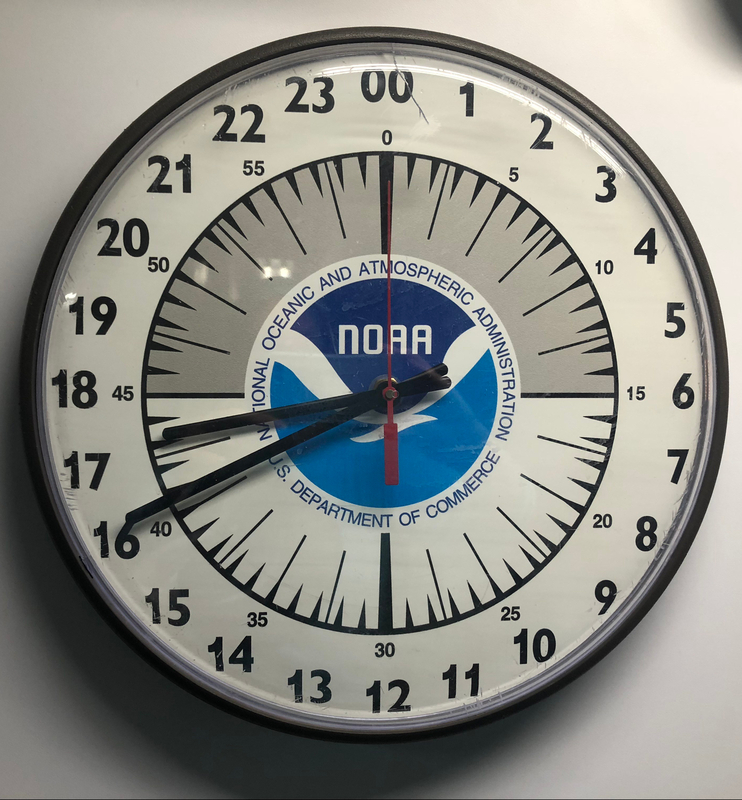 I will chronicle my experiences on NOAA Ship Oregon II while also capturing how the scientific research may translate to the elementary school classroom. Please share your questions and comments in the comments section below, and I will do my best to reply from sea. My students sent me off with many thoughtful questions to address, and I’ll share the answers in subsequent posts. Pelagic fish have bodies designed for long-distance swimming. With their long pectoral fins, the blue shark (Prionace glauca) is highly migratory, traveling great distances across oceans. 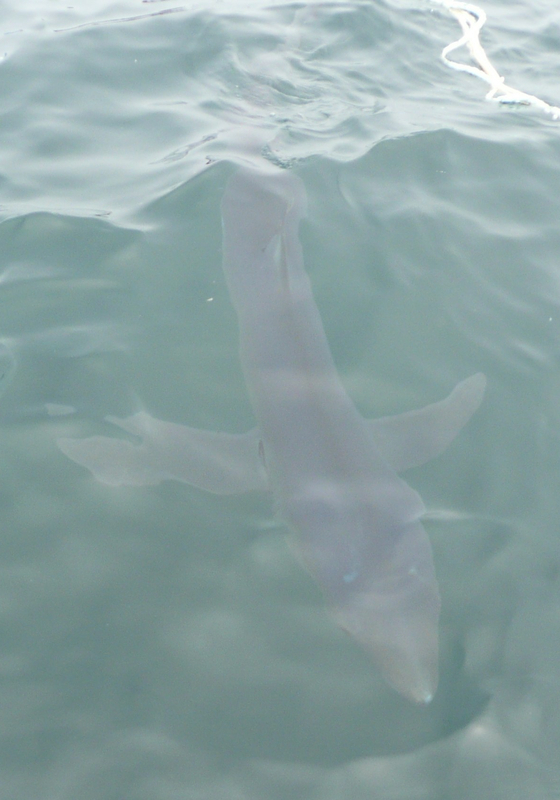 Look carefully: This graceful blue shark was the first shark I saw in the open ocean. Swimming with them was exhilarating! An engaging read-aloud for younger readers.